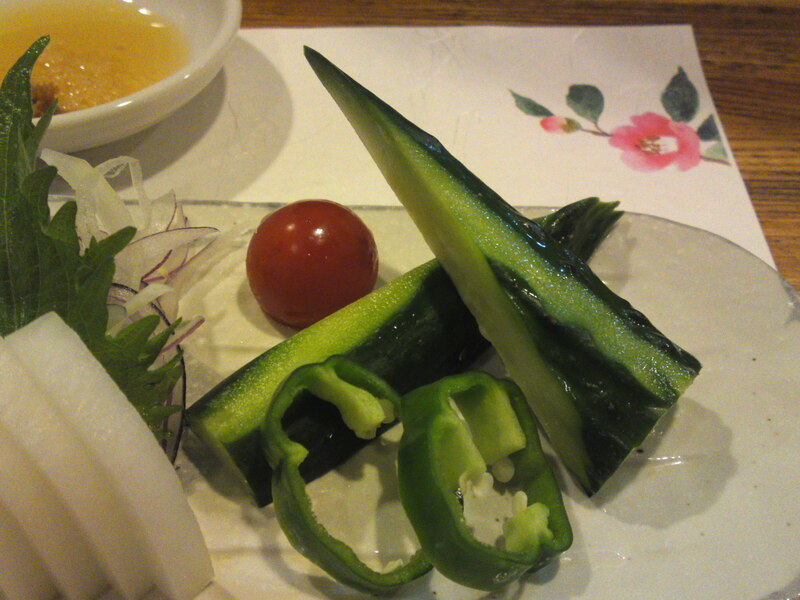 Japanese Vegetarian Lunch with Friends! I am not a vegetarian, and will never be, but I can appreciate a vegetarian, and even a vegan one, from time to time, especially if I have to prepare it! After all, more than 80% of my daily food intake is made o vegetables either from the land or the sea! The other day our good friends from Ireland, Kaori and Colum McCormack who are vegetarian graced with our home with their presence, so we had a vegetarian lunch! 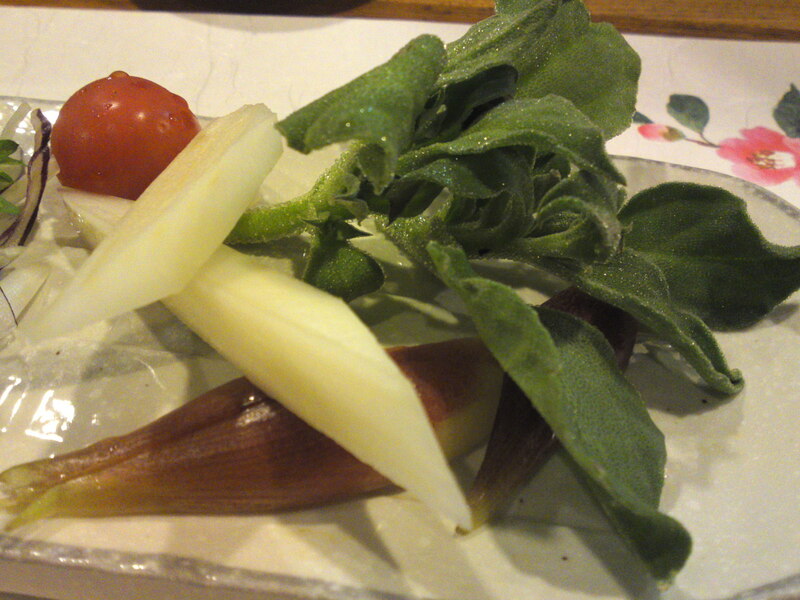 Such a repast is quite easy to conceive as any cuisine is possible in Japan, especially Shizuoka whose neutral climate allows for a regular vegetable supply all year round. 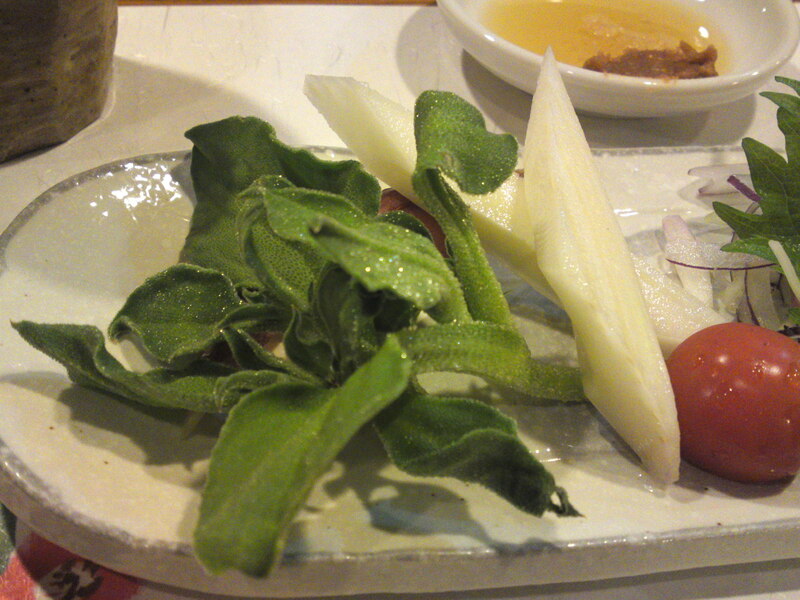 Spicy “kinpira” made up of konnyaku/konjac and gobooo/burdock root strips seasoned with sesame seeds! 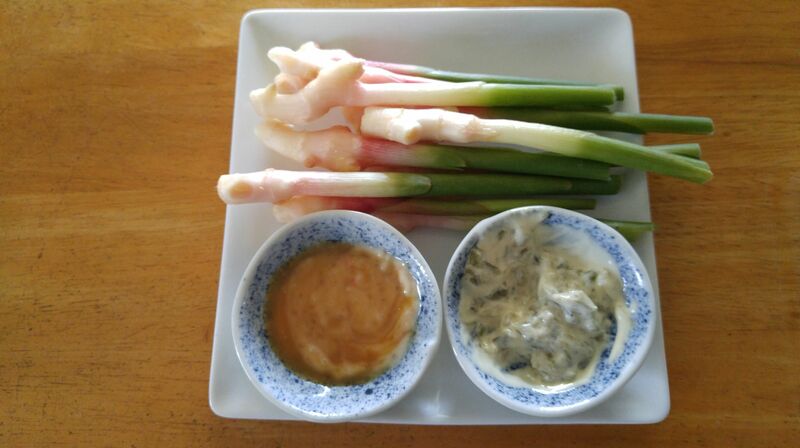 Fresh ha–shouga/leafy ginger root with two kinds of dip sauce! 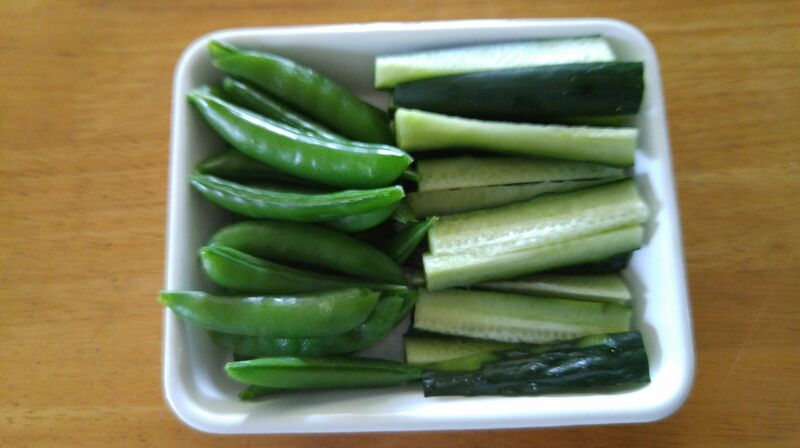 Snap endou/green peas in the pod and kyuuri/Japanese cucumber strips! 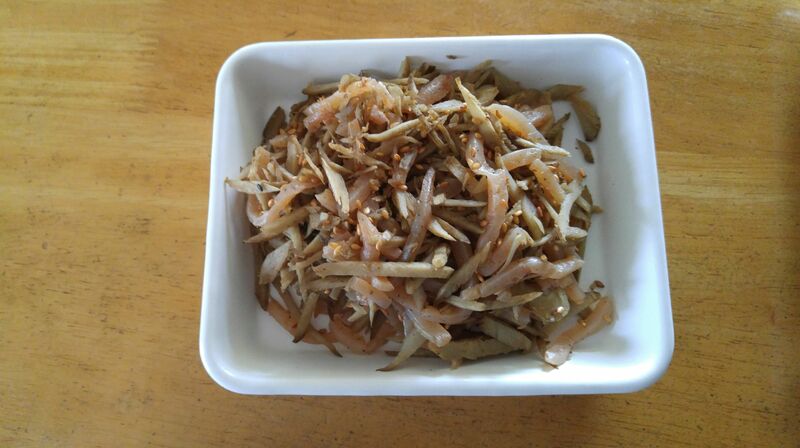 Fried ajillos-style bamboo shoots (fresh but boiled beforehand)! 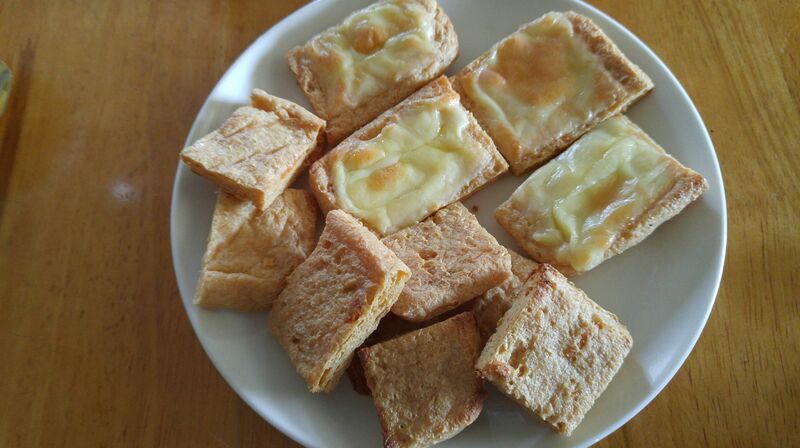 Aburaage/grilled tofu sheets baked with and without cheese topping! 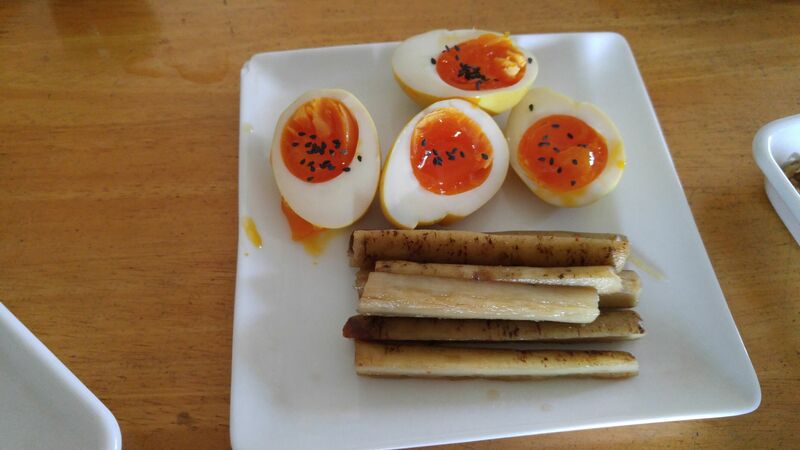 Japanese-style hanjuku/half-boiled egg (with black sesame seeds) and pickled gobou/burdock root! 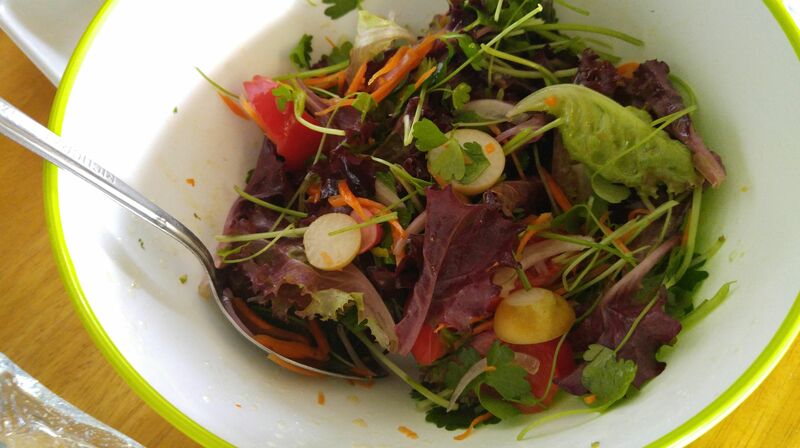 Tossed vegetable salad (most vegetables organically grown by your servant!)! 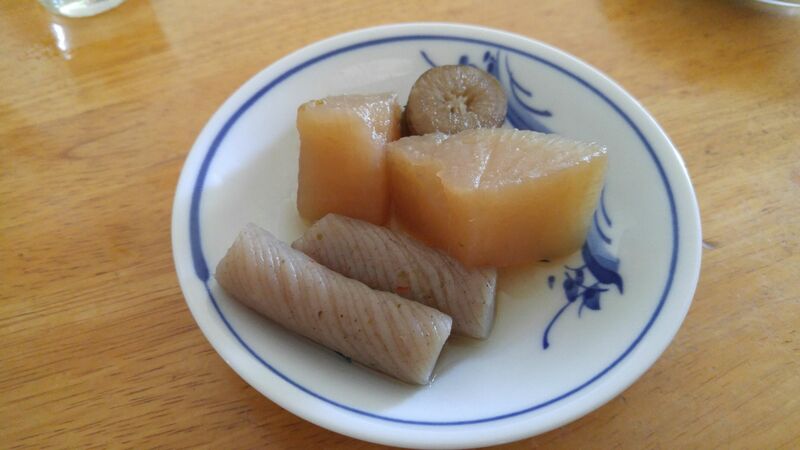 Oden/Japanese pot-au-feu with daikon radish, konnyaku/konjac and gobou/burdock root! 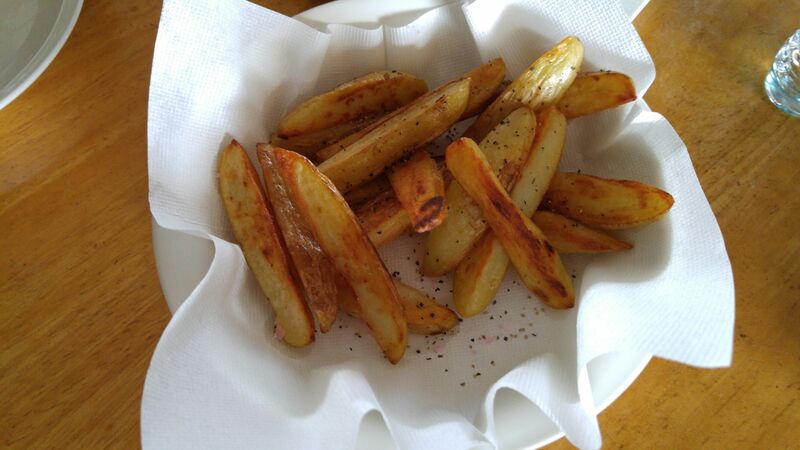 Pommes frites (I’m French!) 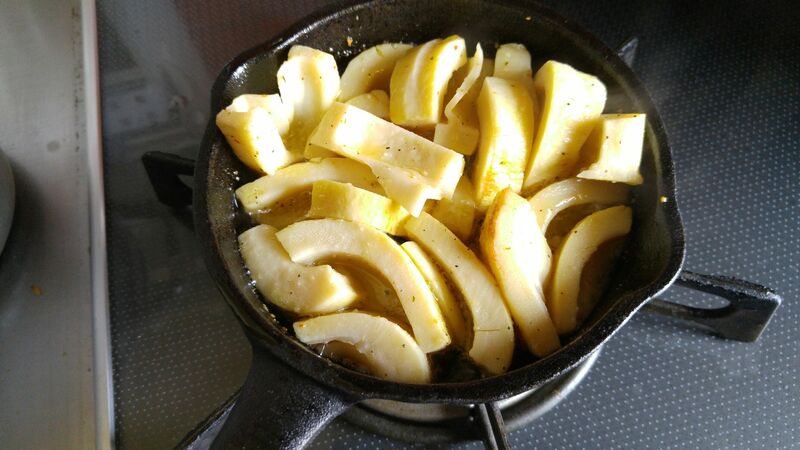 with local new May Queen potatoes shallow-fried in three steps with their skins! 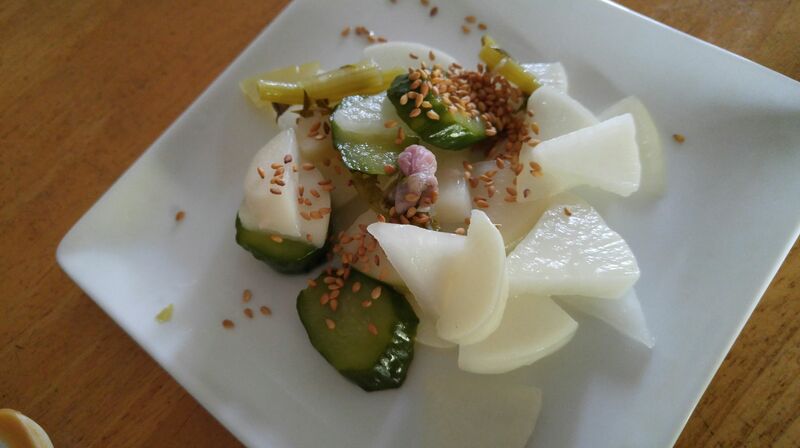 Sakura tsukemono/Japanese-style light pickles with salted cherry blossoms! 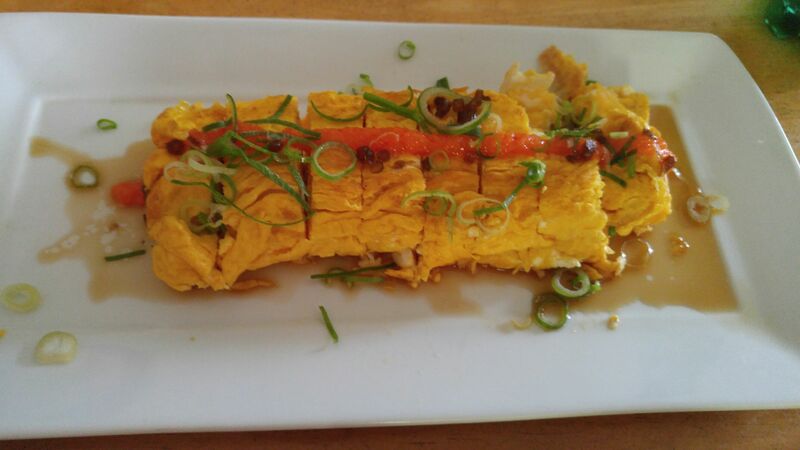 Herb tamagoyaki/Japanese omelette topped with momiji-oroshi/grated daikon with chili pepper! As for dessert we had plenty of fruit! 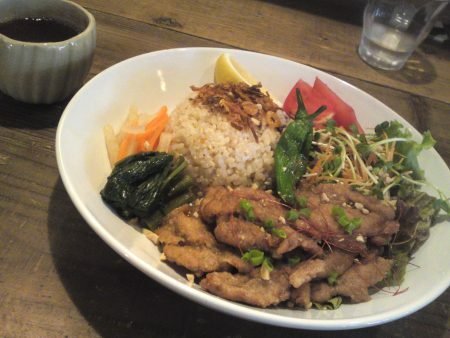 Many first-comers to Shizuoka have been easily convinced that we can take care of all their culinary priorities! 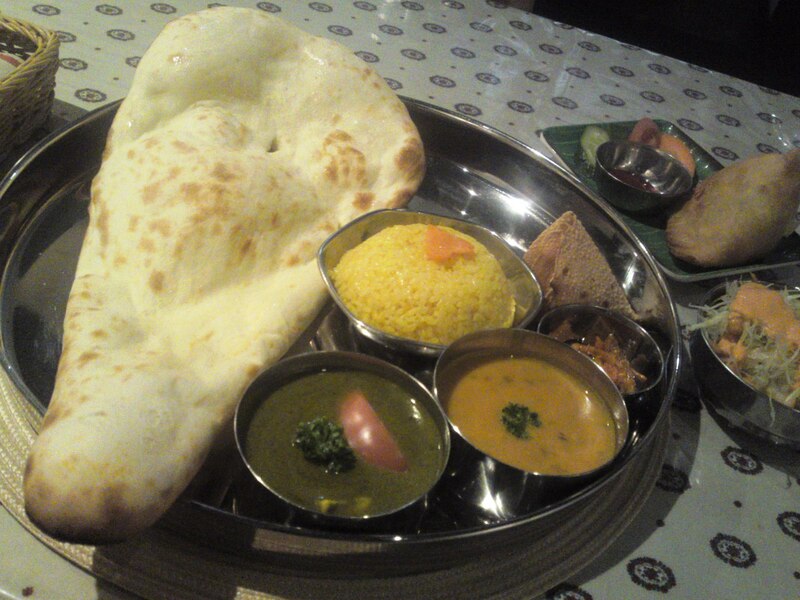 Nepalese-Indian Gastronomy: Vegetarian Lunch at Namaste Nippon in Shizuoka City! 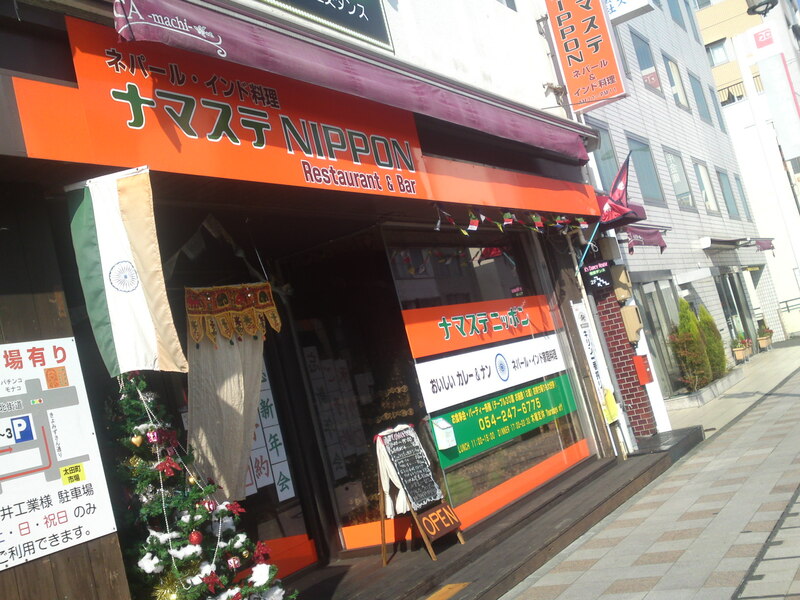 Namaste Nippon Nepalese-Indian Restaurant and its bright colors have been standing along the Kitakaido Street in Aoi Ku, Shizuoka City, 10 minutes walk from Cenova Department Store, and had often been recommended to me by friends. I took advantage of free time at lunch the other day to pay them a belated visit! The owner and the staff all hail from Nepal but the chefs graduated from a cooking school in India, allowing them to combine the two cuisines with even a little Japanese twist at times! Lunch time is particularly busy and they do have a hefty menu! 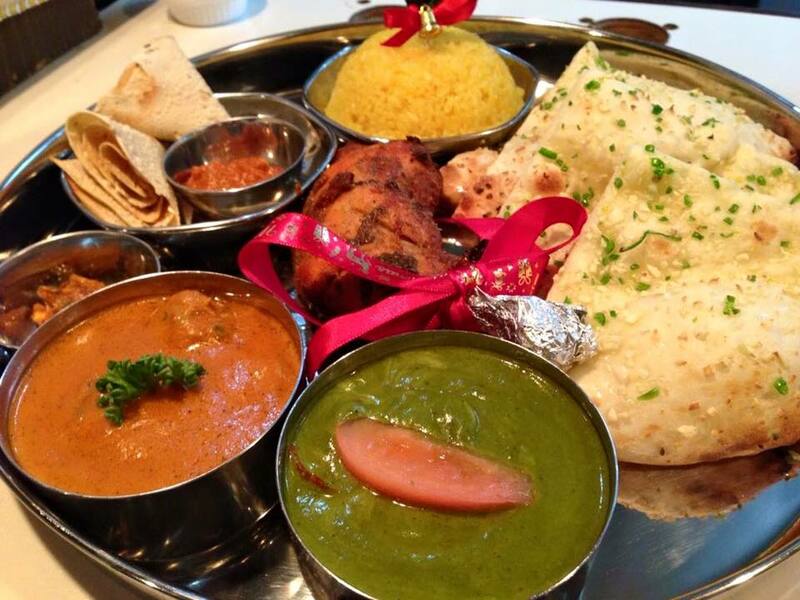 One can choose from set menus or single dishes. I already know I’ll have to plan a few more visits! 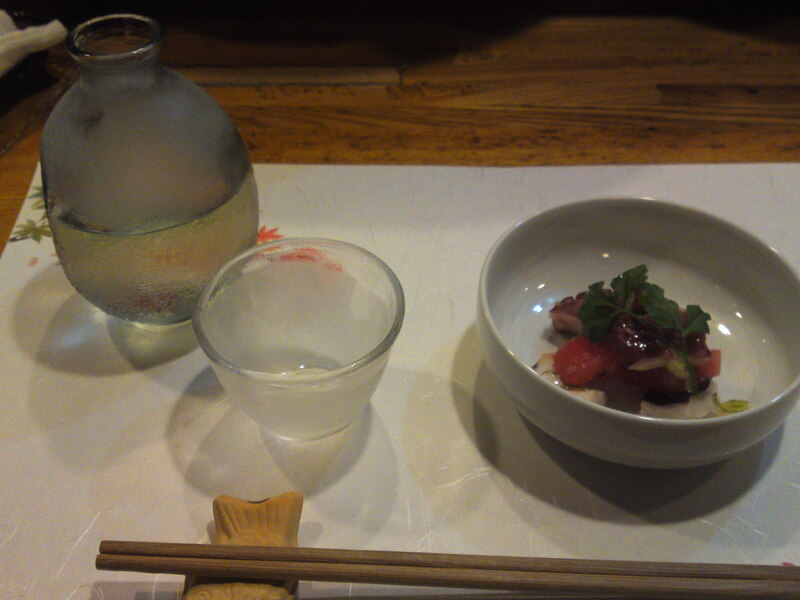 A good idea, since they serve a great variety of drinks including Shizuoka sake, would be to g there for a drink in the evening and eat their food as snacks! 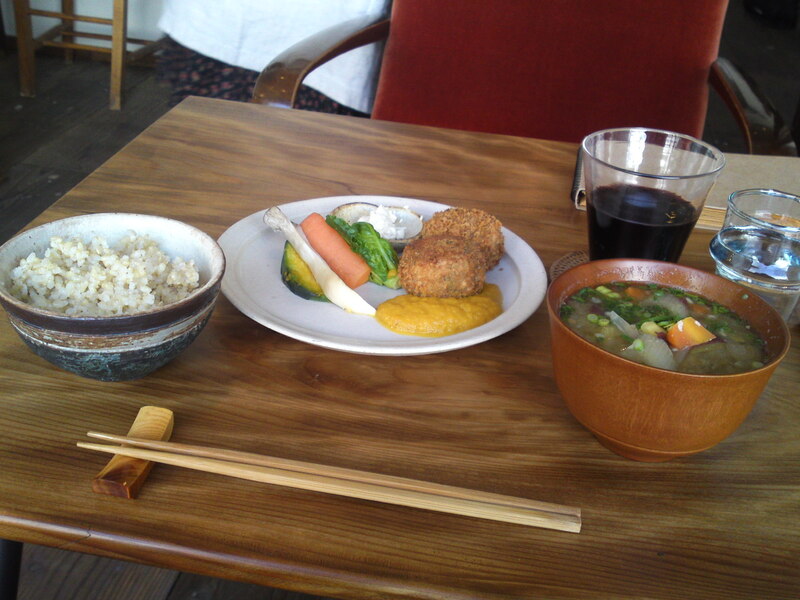 I chose the vegetarian set lunch which should give me a good idea of the chefs’ skills! 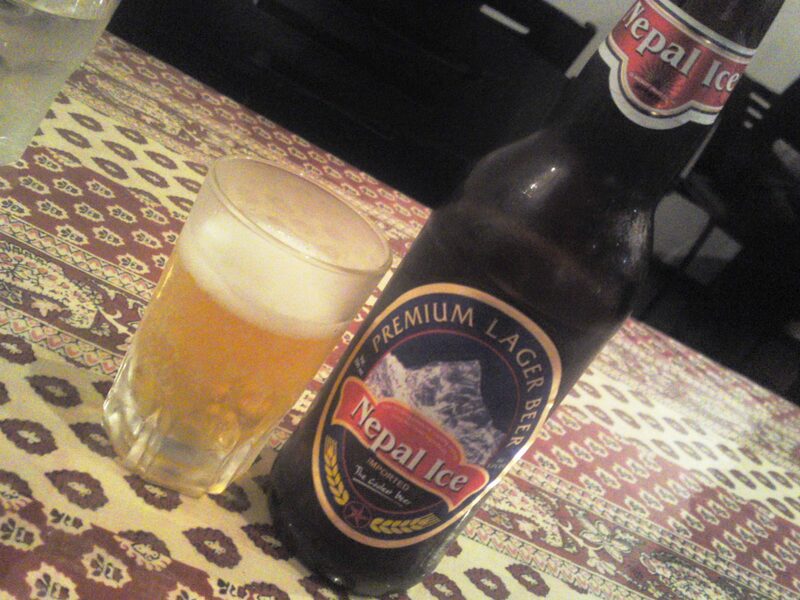 But first of all I had to taste a “Nepal Ice” beer! 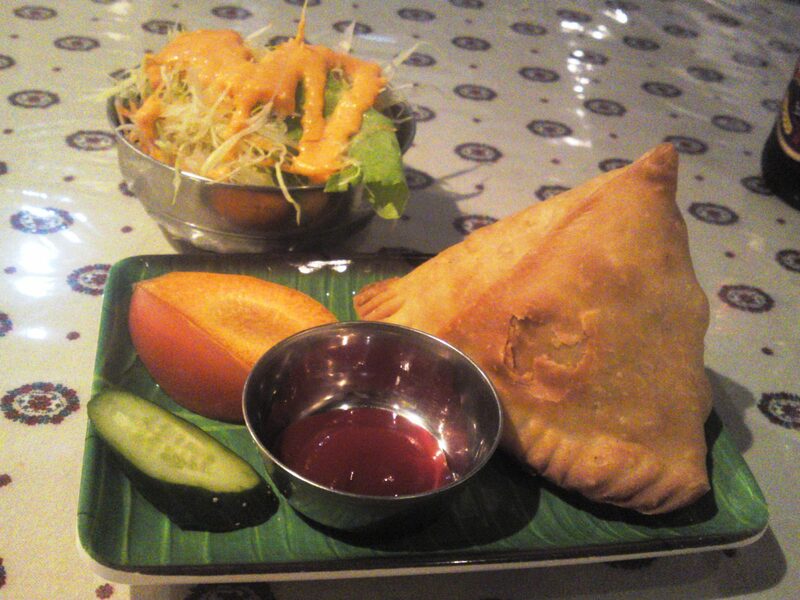 Enormous potato samosa coming fresh and hot on your plate with vegetable salad! It would be enough as a great snack with a nice beer in the evenings! 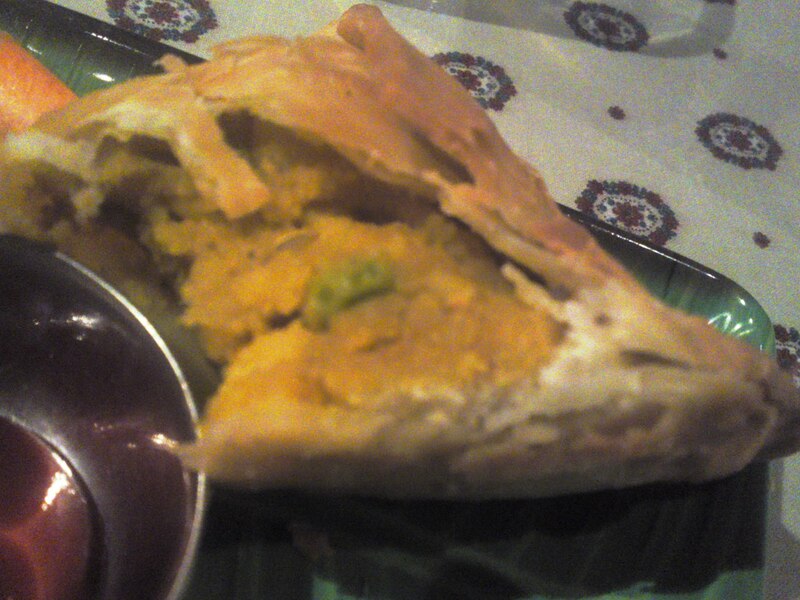 The Vegetarian Lunch Plate, which includes the aforementioned samosa and a drink! 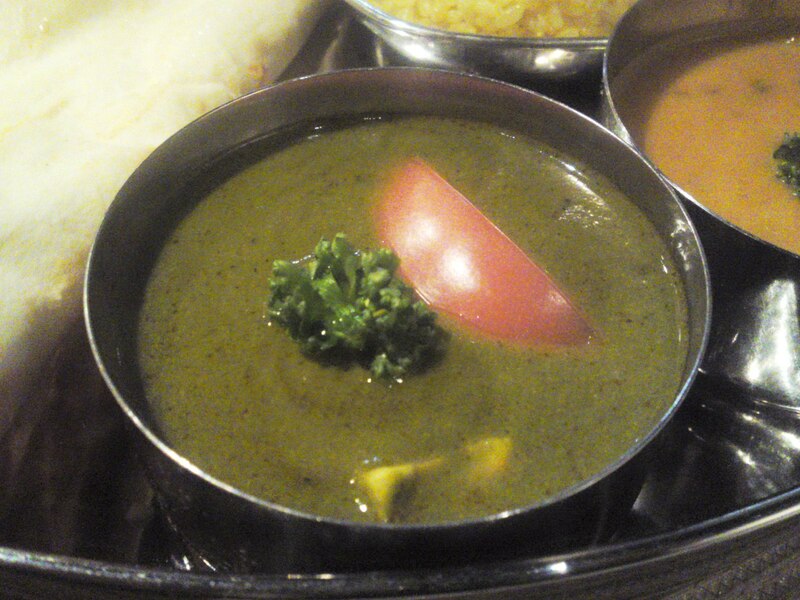 I opted for the above “Parapanilu” spinach and cottage cheese curry! The third one was “Alparaku” Potato and Cottage Cheese! 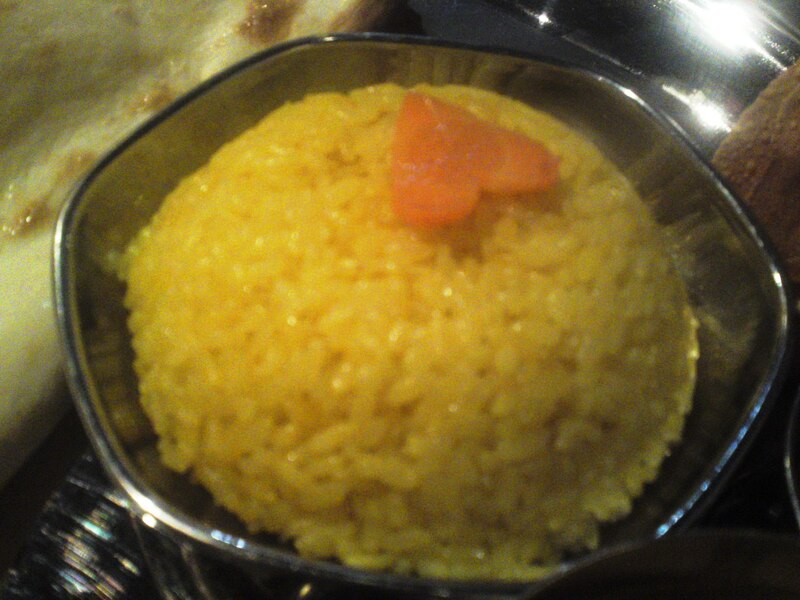 One can opt for plain rice, too! 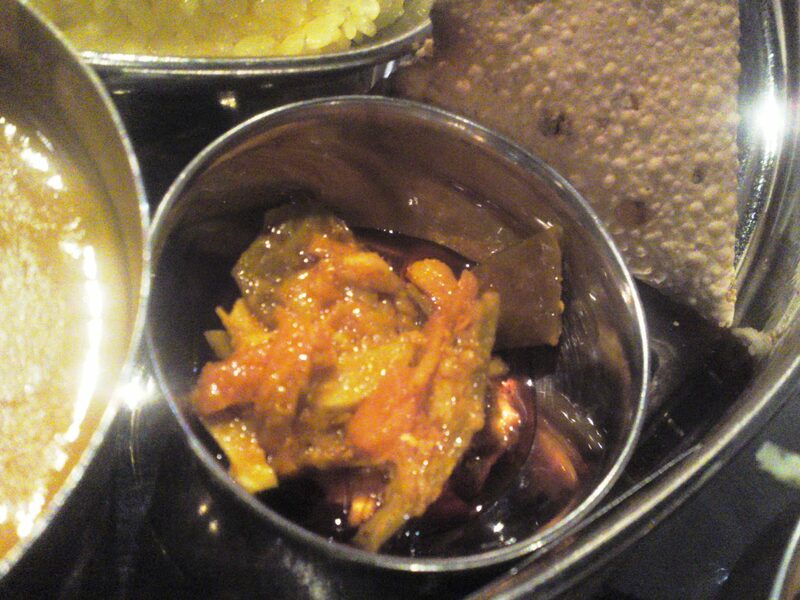 “Achar” home-made Nepalese vegetable pickles! Very tasty! 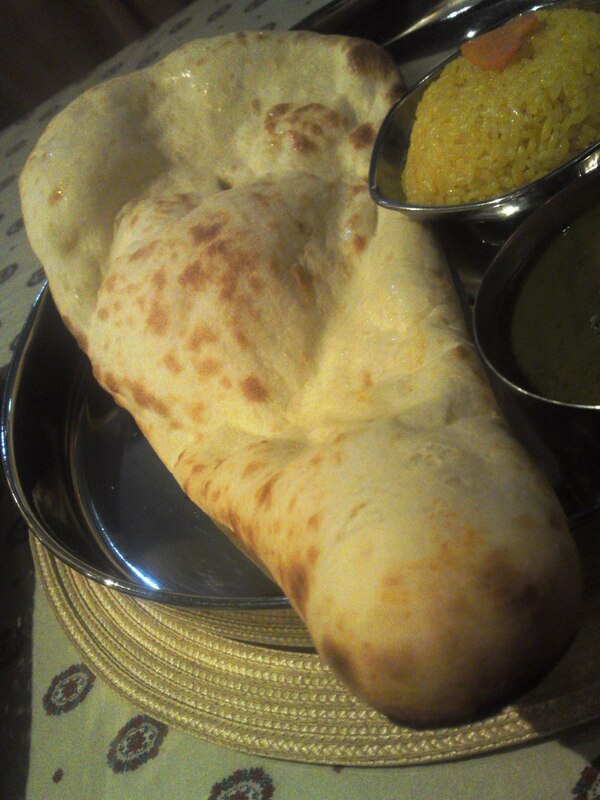 And a great freshly baked nan! 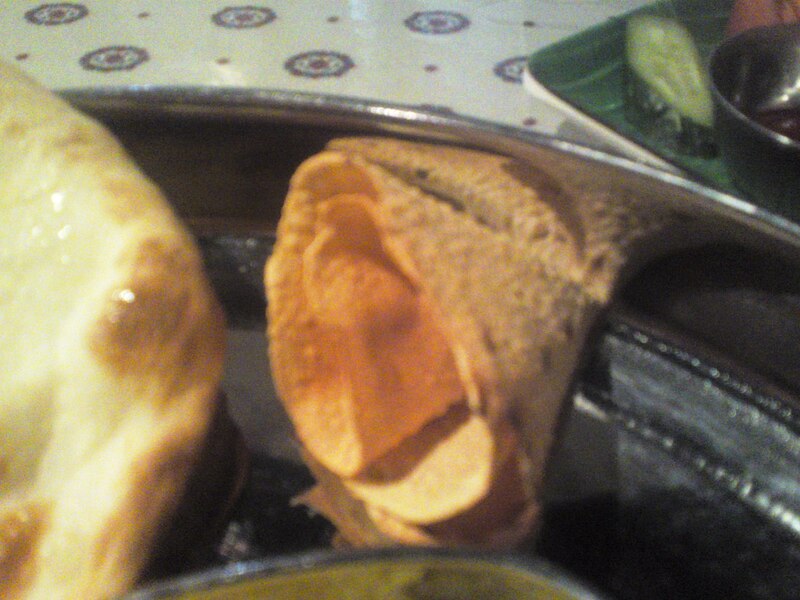 Actually they bake many kinds of nan, chapati and so on! Try the same with two of you! Great fun! 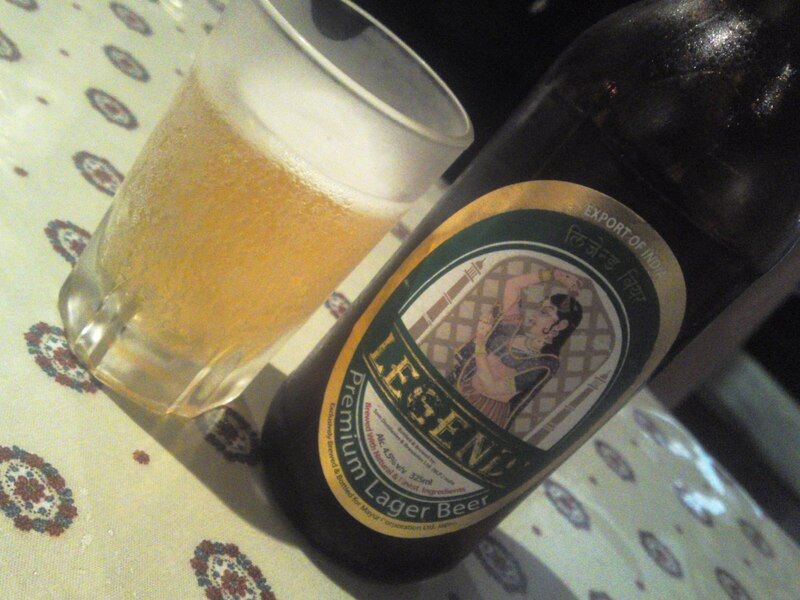 I couldn’ help taste an Indian Legend beer! 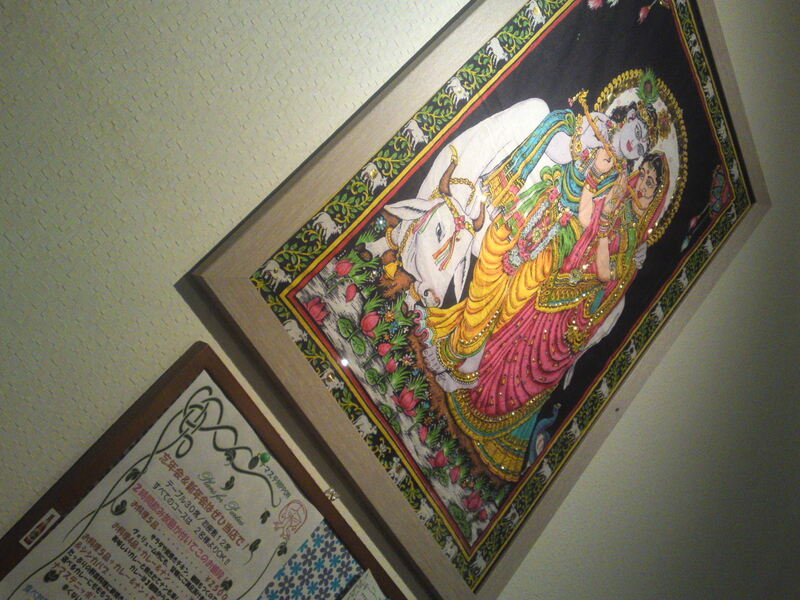 Meet you in the evening there again! 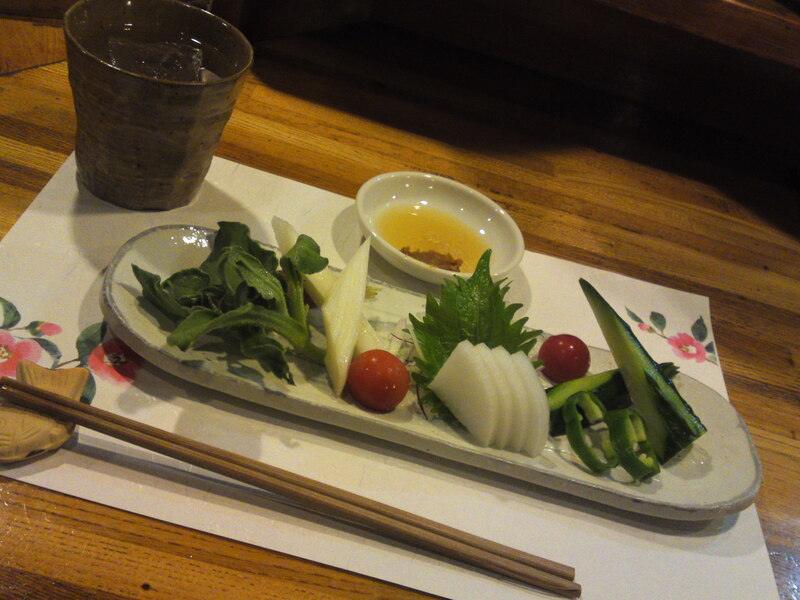 More Vegan & Vegetarian Gastronomy: Vegetable Sashimi and Okinawa Awamori at Yasaitei in Shizuoka City! 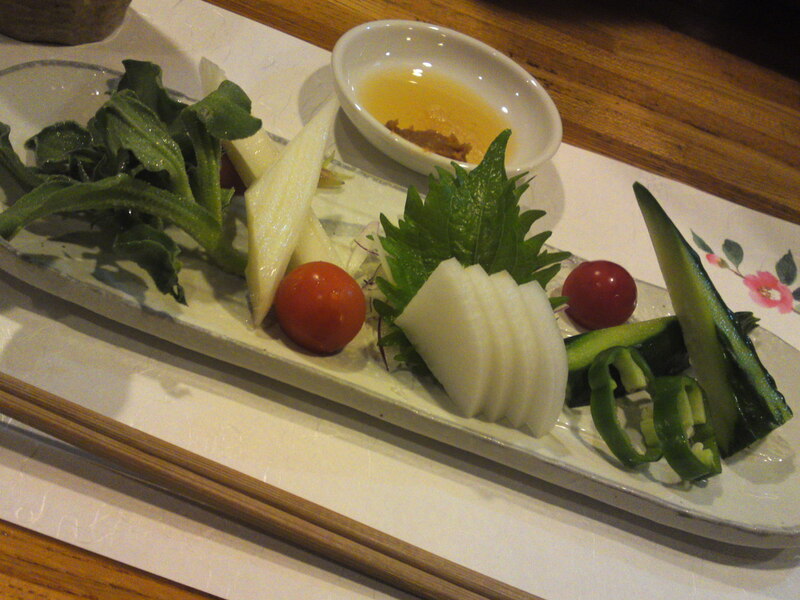 Strong points: Vegan and vegetarian Cuisine possible any time, Izakaya gastronomy, local products, oden. Good list of sake, shochu. Wines also available. I had another occasion to visit Yasaitei the other day! 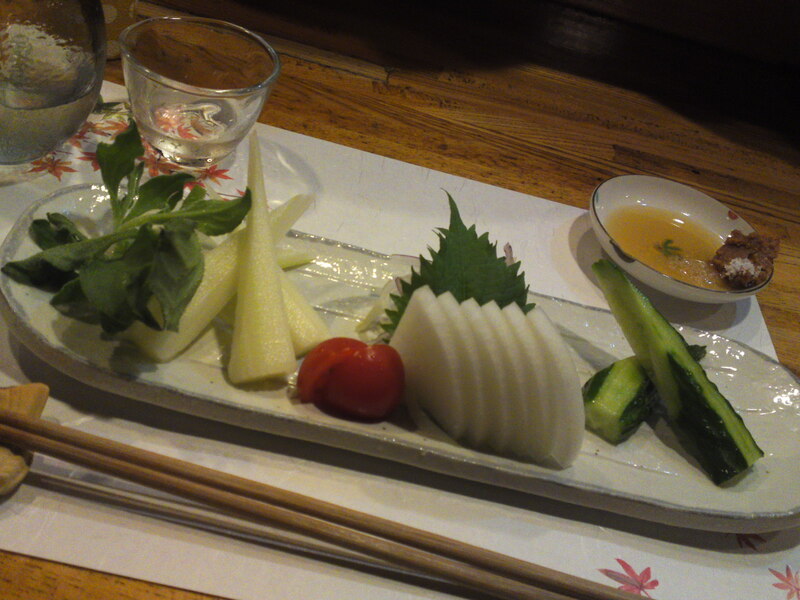 Of course I had another plate of vegetable sashimi but this time I enjoyed a totally different drink! Awamori, a very strong spirit akin to shochu made in Okinawa with Thai rice! 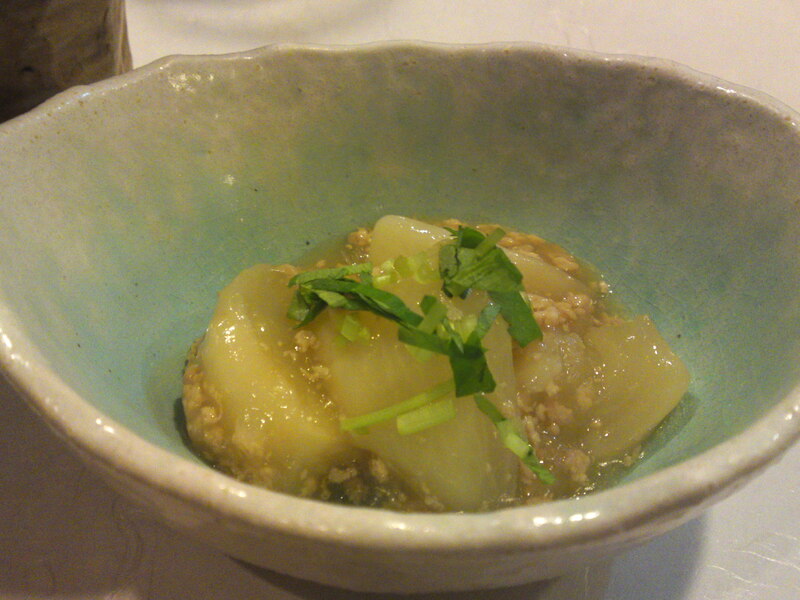 The o-toshi/appetizer was not not vegetarian but it was nonetheless exquisite: kabu/small turnip with chicken soboro in sweet and sour sauce! 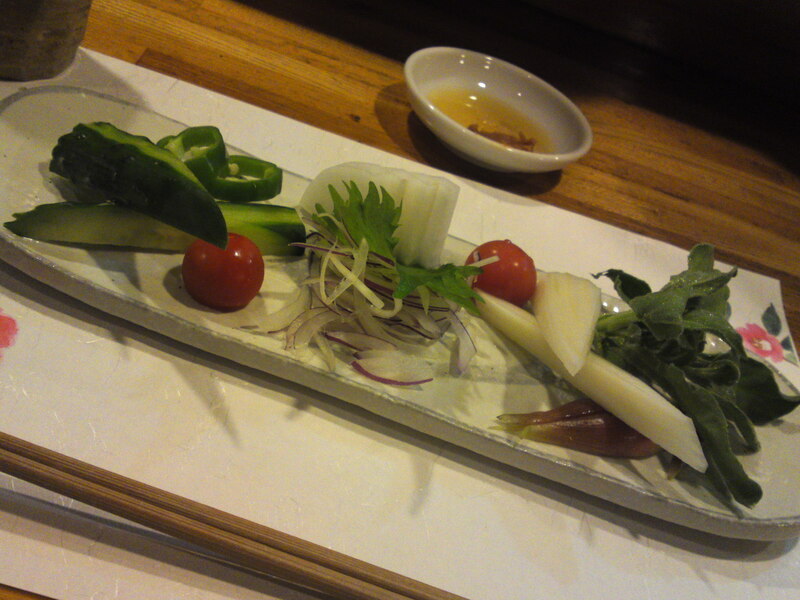 The vegetable sashimi plate of the day! As usual served with a “dressing” of sesame oil, miso paste and rock salt! 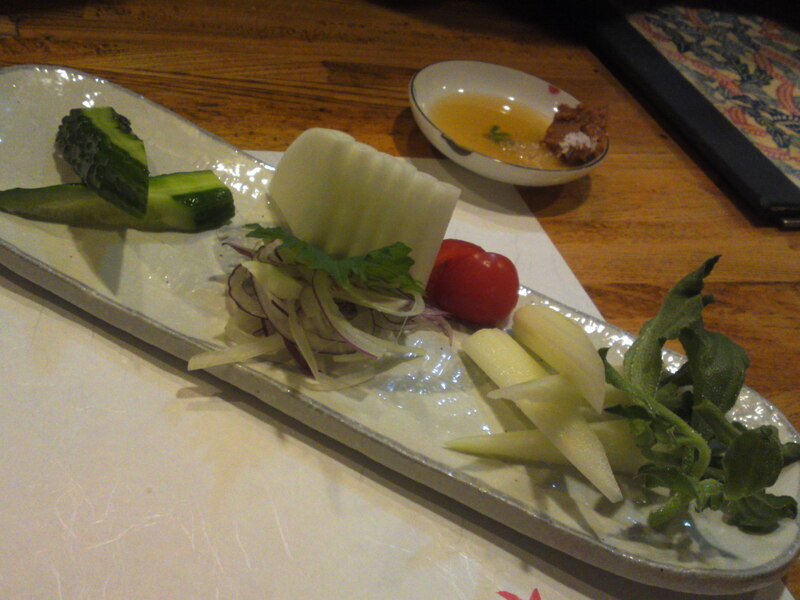 Let me show you the vegetable sashimi plate from both sides for a better understanding of the arrangement! 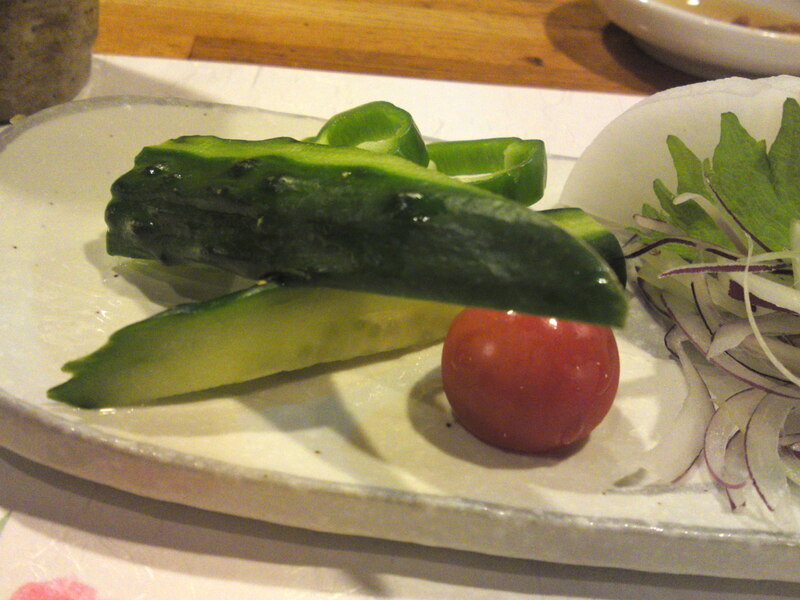 Tomato, cucumber and green pepper! Next, from the other side! 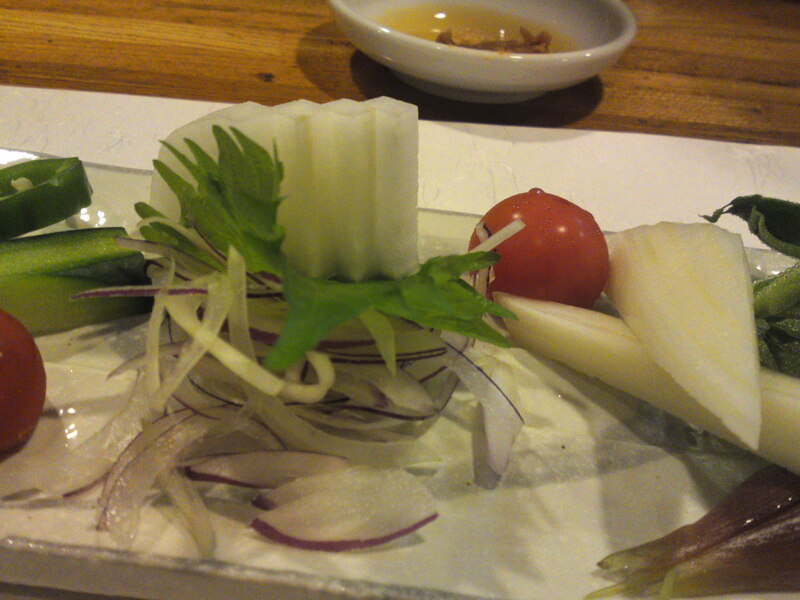 Onion, myoga ginger, shiso, daikon! 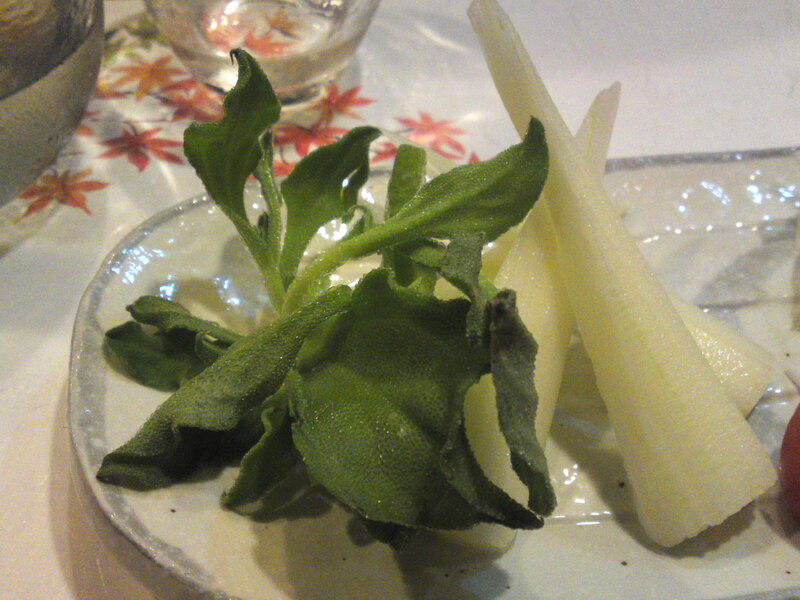 Myoga ginger, celery and ice plant! See you there again soon! 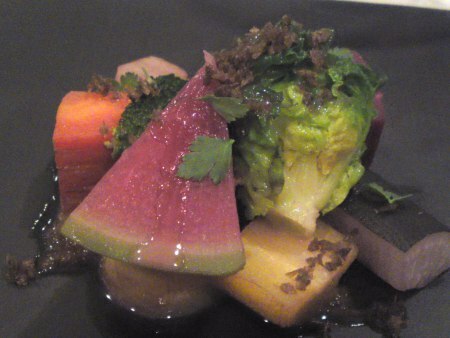 Vegan & Vegetarian Gastronomy: Vegetable Sashimi at Yasaitei in Shizuoka City! 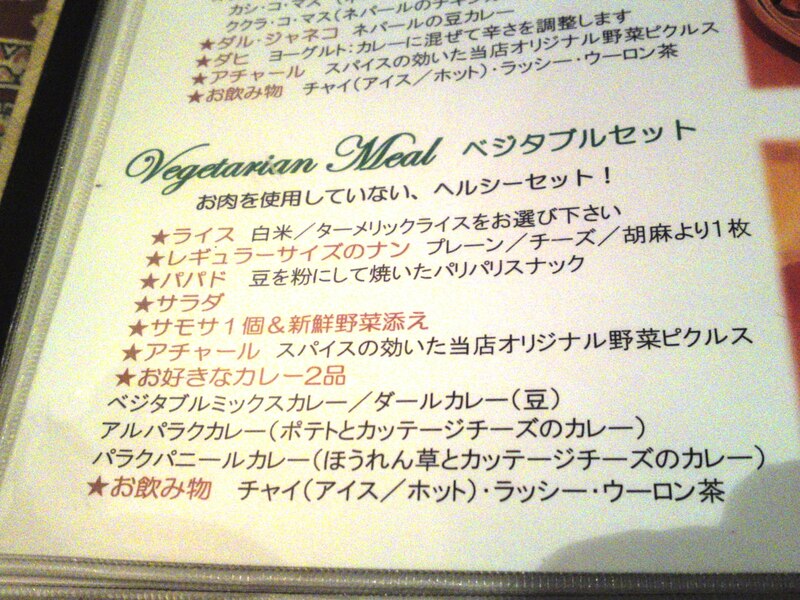 Time and again I have said that vegans and vegetarians would probably have their happiest times in Japan, at least for gastronomes, because this country, and especially Shizuoka with its mild weather and abundance of vegetables all year round, can provide all ingredients all year round whose traceability is easy to prove! 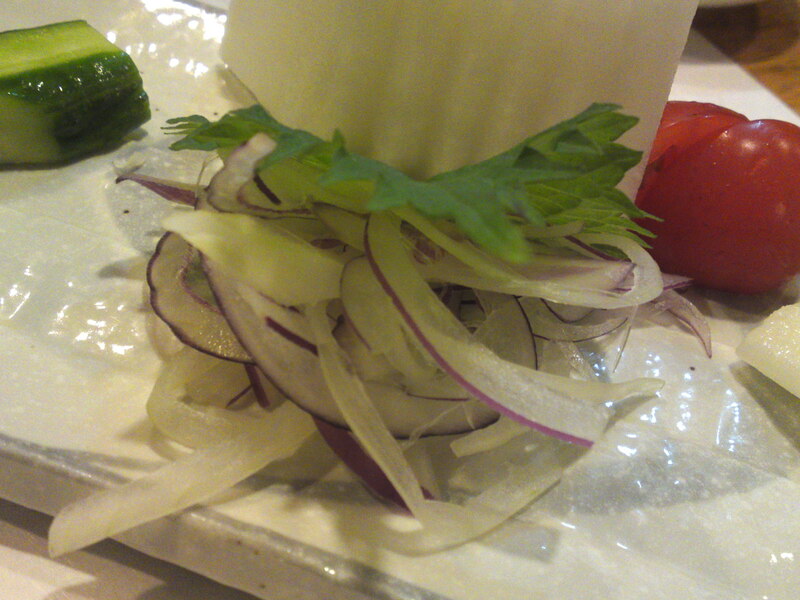 The above o-tooshi/お通し/is not vegetarian, but you aforementioned priorities will ensure it is! 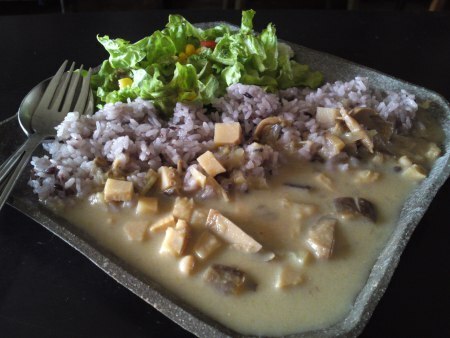 There are many places in Shizuoka City and Prefecture offering alternatives to their omnivorous dishes for vegans and vegetarians who still want to enjoy their outing with friends with different priorities. 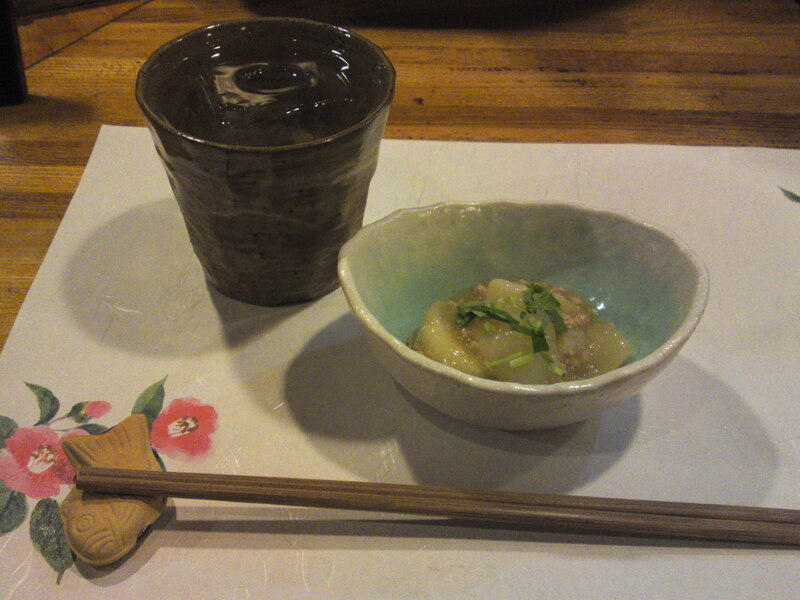 One such place, and arguably the best at it, is Yasaitei in Tokiwa Cho, Aoi Ku, Shizuoka City! The above is the basic one, but you certainly may order for a bigger variety! View for the other side! One thing all these vegetables have in common is that they are super fresh, crunchy, juicy and so tasty! 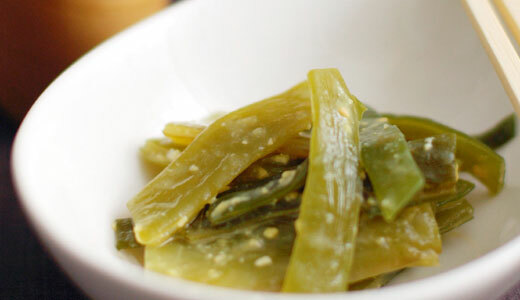 Simple but exquisite dressing made with higher-class sesame oil, rock salt and miso paste! For friends who like seafood: cod roe steamed and marinated in rice vinegar! 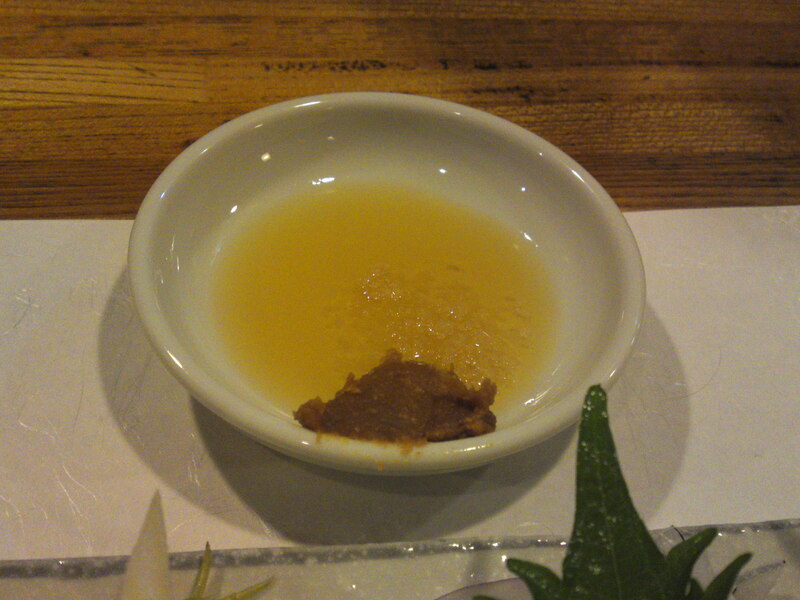 Mozuku in amazu/sweet vinegar as served at Yasaitei, Shizuoka City. 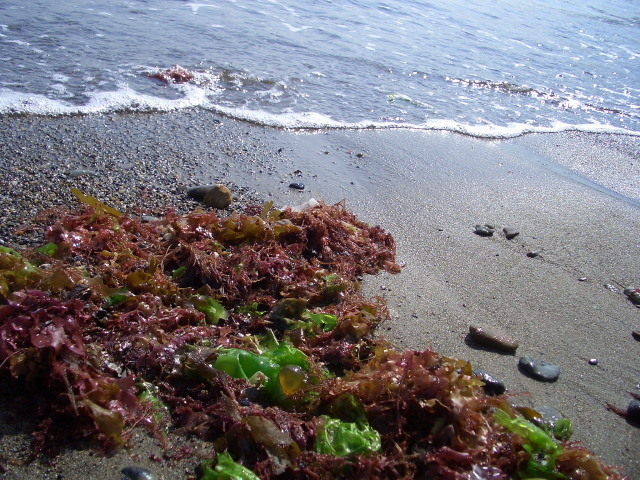 Seaweed or algae have been used for eons by humans, but have only been recently rediscovered as a food of their own. 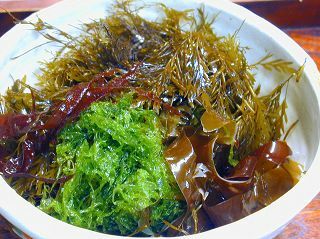 Seaweeds are consumed by coastal people, particularly in East Asia, e.g., Japan, China, Korea, Taiwan, Thailand, and Vietnam, but also in Indonesia, Belize, Peru, the Canadian Maritimes, Scandinavia, Ireland, Wales, Philippines, and Scotland. It is rich in calcium and magnesium and seaweed noodles can be cooked into pancit canton, pancit luglug, spaghetti or carbonara. 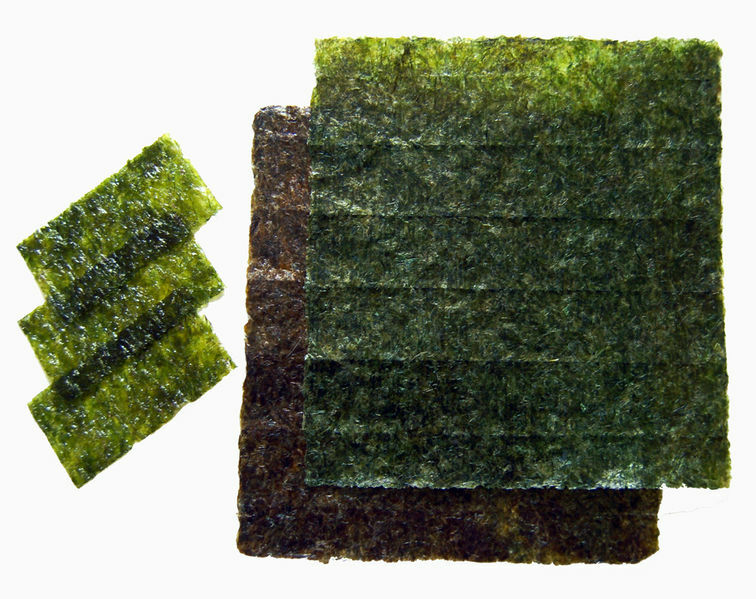 In Asia, Zicai (紫菜) (in China), gim (in Korea) and nori (in Japan) are sheets of dried Porphyra used in soups or to wrap sushi. 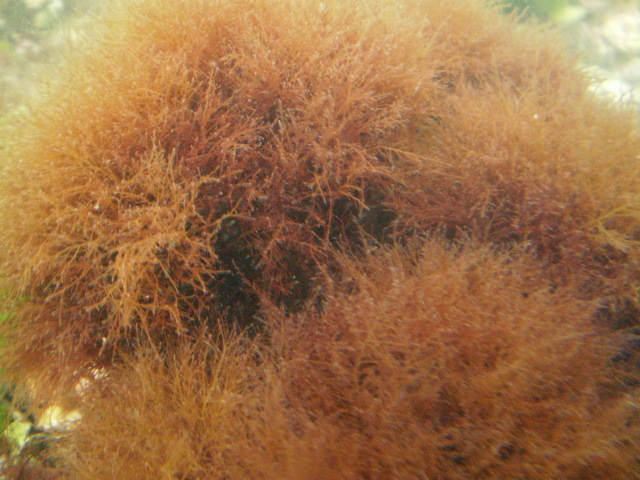 Chondrus crispus (commonly known as Irish moss or carrageenan moss) is another red alga used in producing various food additives, along with Kappaphycus and various gigartinoid seaweeds. 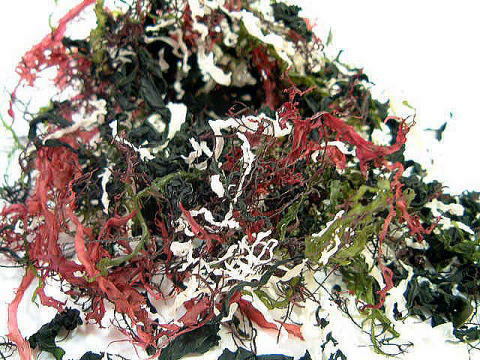 Porphyra is a red alga used in Wales to make laver. 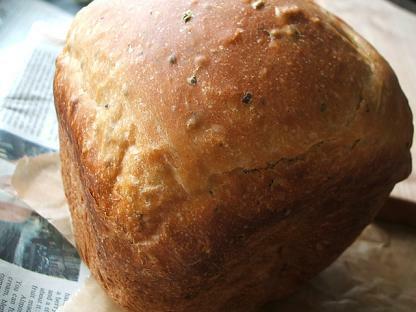 Laverbread, made from oats and the laver, is a popular dish there. Affectionately called “Dulce” in northern Belize, seaweeds are mixed with milk, nutmeg, cinnamon, and vanilla to make a common beverage. 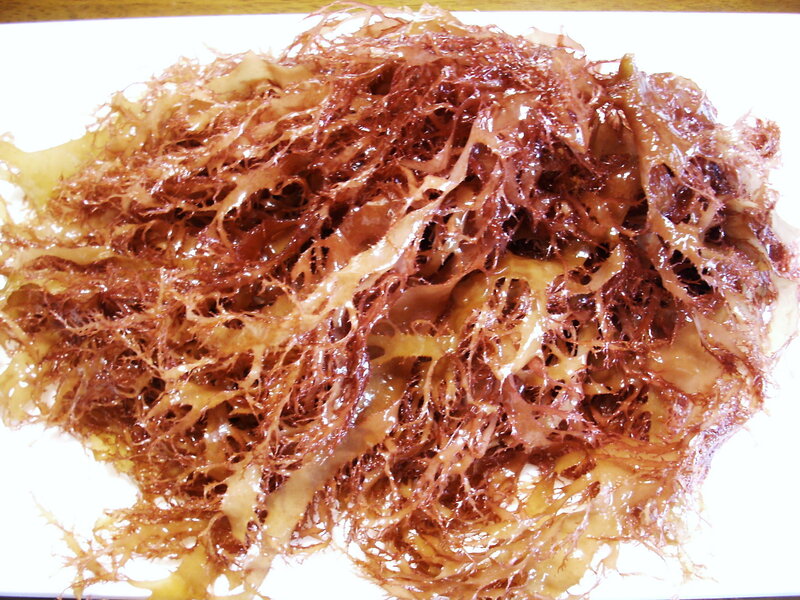 Seaweeds are also harvested or cultivated for the extraction of alginate, agar and carrageenan, gelatinous substances collectively known as hydrocolloids or phycocolloids. Hydrocolloids have attained commercial significance as food additives. The food industry exploits their gelling, water-retention, emulsifying and other physical properties. 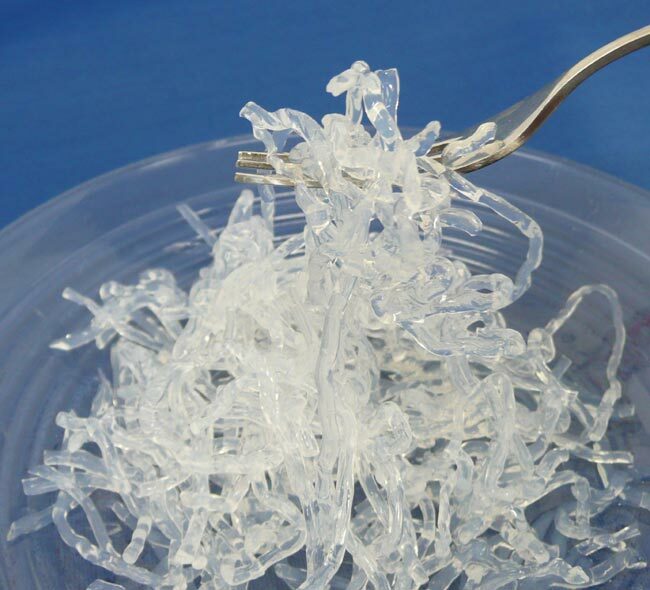 Agar is used in foods such as confectionery, meat and poultry products, desserts and beverages and moulded foods. Carrageenan is used in salad dressings and sauces, dietetic foods, and as a preservative in meat and fish products, dairy items and baked goods. Alginates are used in wound dressings, and production of dental moulds. In microbiology research, agar is extensively used as culture medium. 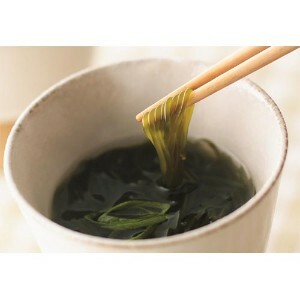 Seaweed is a source of iodine, necessary for thyroid function and to prevent goitre. 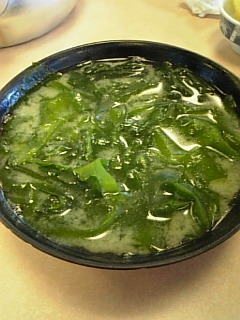 Konbu Tsukudani, a popular Japanese seaweed dish. -Konbu/昆布, or Laminariaceae Bory (Latin), comprises many varieties, some of them regional: Makonbu or Saccharina japonica（真昆布）, Onikonbu or Laminaria diabolica（羅臼昆布）, Rishiri Konbu or Laminaria ochotensis（利尻昆布）, Hosome Konbu or Laminaria religiosa（細目昆布）, Hitaka or Mitsuishi Konbu or Laminaria angustata（日高昆布、三石昆布）, Naga or Hamanaka Konbu or Laminaria longissima（長昆布、浜中昆布）, and Kagome or Kjellmaniella crassifolia（籠目昆布）. 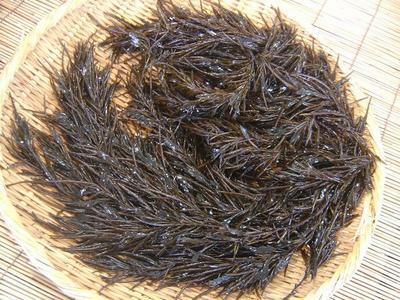 -Hijiki or hiziki (ヒジキ, 鹿尾菜 or 羊栖菜, hijiki) (Sargassum fusiforme, or Hizikia fusiformis) is a brown sea vegetable growing wild on rocky coastlines around Japan, Korea, and China. Its two names mean deer-tail grass and sheep-nest grass respectively. -Hibatama or Fucus, a genus of brown alga in the Class Phaeophyceae to be found in the intertidal zones of rocky seashores almost everywhere in the world. 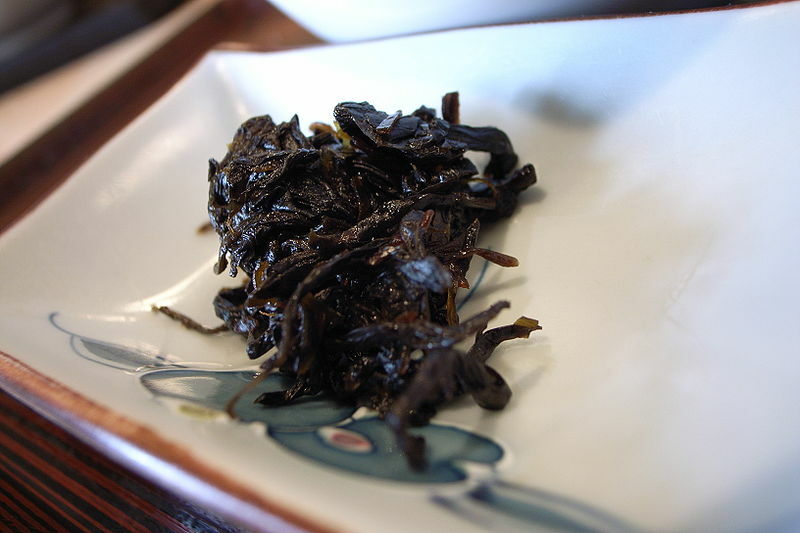 -Mozuku, or Cladosiphon okamuranus (水雲; 藻付; 海蘊; 海雲) , a type of edible seaweed in the genus Cladosiphon, naturally found in Okinawa, Japan. Most of the mozuku now is farmed by locals, and sold to processing factories. 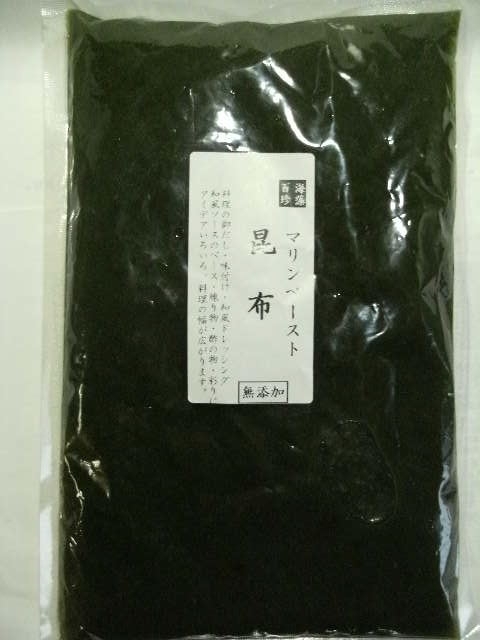 The main use of mozuku is as food, and as source of one type of sulfated polysaccharide called Fucoidan to be used in cancer treatment aid health supplements. 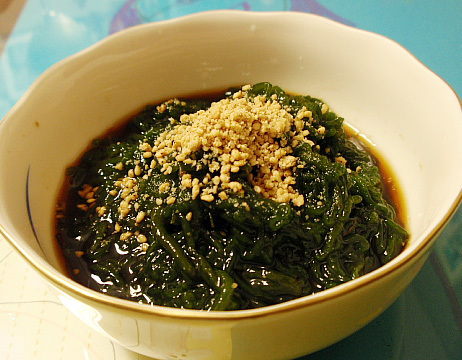 -Wakame (ワカメ), Undaria pinnatifida, a sea vegetable, or edible seaweed. 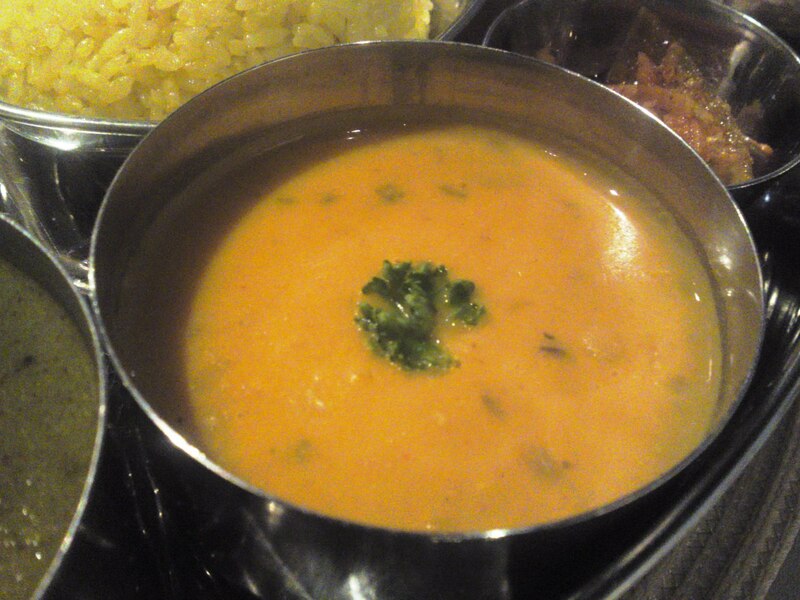 In Japan it is most widely used in miso soup. Yes, these violet and green alagae are edible! -Asakusa Nori, or アサクサノリ（浅草海苔 (Porphyra tenera). -Tengusa, which gives agar agar, a gelatinous substance. 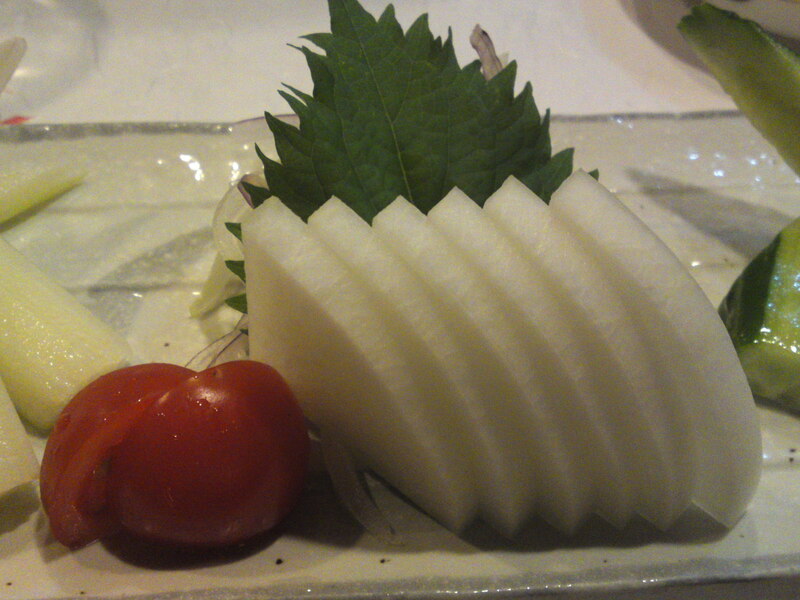 Historically and in a modern context, it is chiefly used as an ingredient in desserts throughout Japan, but also as solid jelly used as decoration in salads and others. 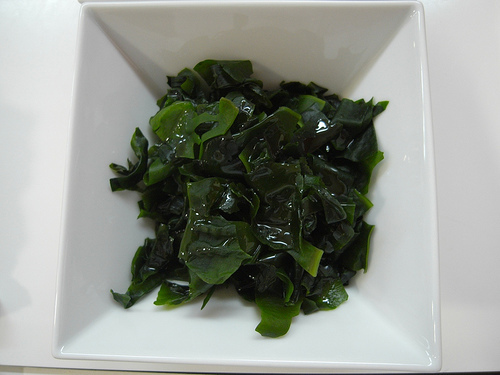 -Aosa or sea lettuce comprising comprise the genus Ulva, a group of edible green algae that are widely distributed along the coasts of the world’s oceans. 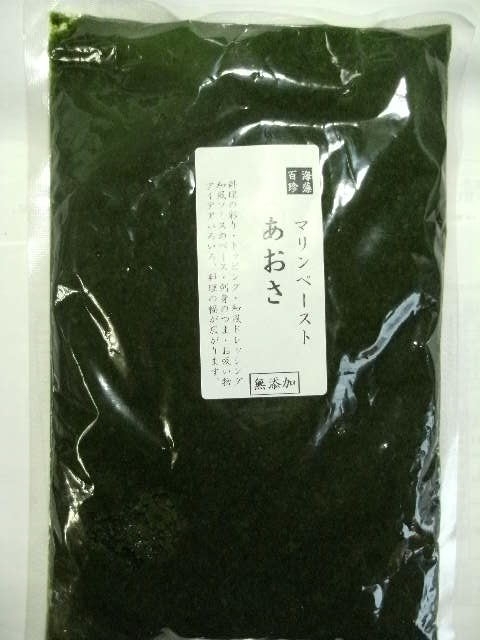 -Aonori (青海苔 or アオノリ, “blue seaweed” or “green seaweed”), also known as green laver, a type of edible green seaweed, including species from the genera Monostroma and Enteromorpha of Ulvaceae. 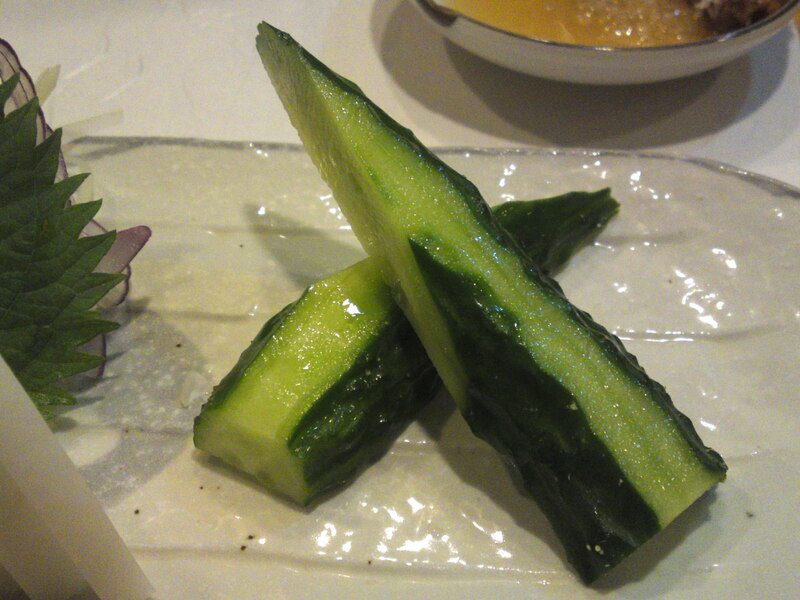 It is commercially cultivated in some bay areas in Japan, such as Ise Bay. It contains rich minerals such as calcium, magnesium, lithium, vitamins, and amino acids such as methionine. 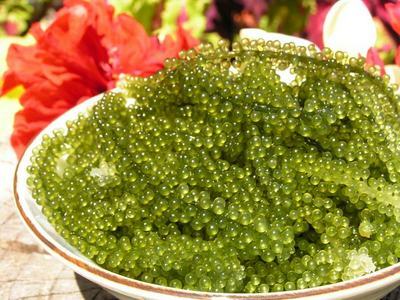 -Umibudou, or sea grapes, a delicacy of its own! They often come as a mixture! 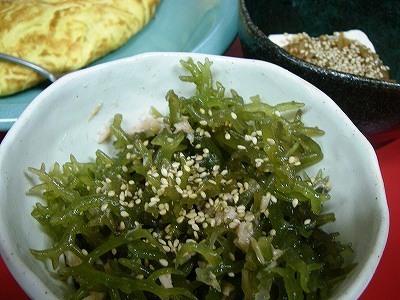 Here are some examples of the use of seaweed in Japanese gastronomy that can be expanded and inspired from wherever in the world you are, you being vegan, vegetarian or omnivore! I have reduced the size of the pictures. Click on them to enlarge and copy them! 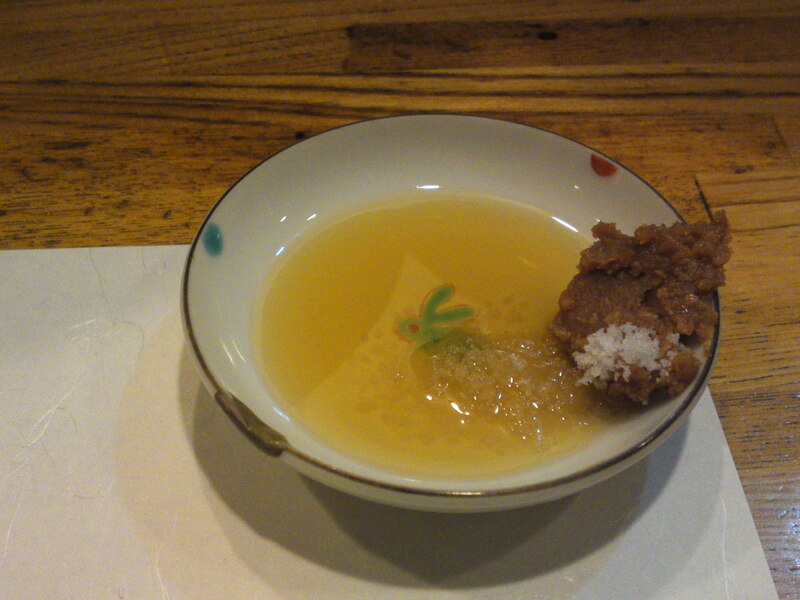 Agar or Crystal Kaiso/Crystal Seaweed! The same in a salad! 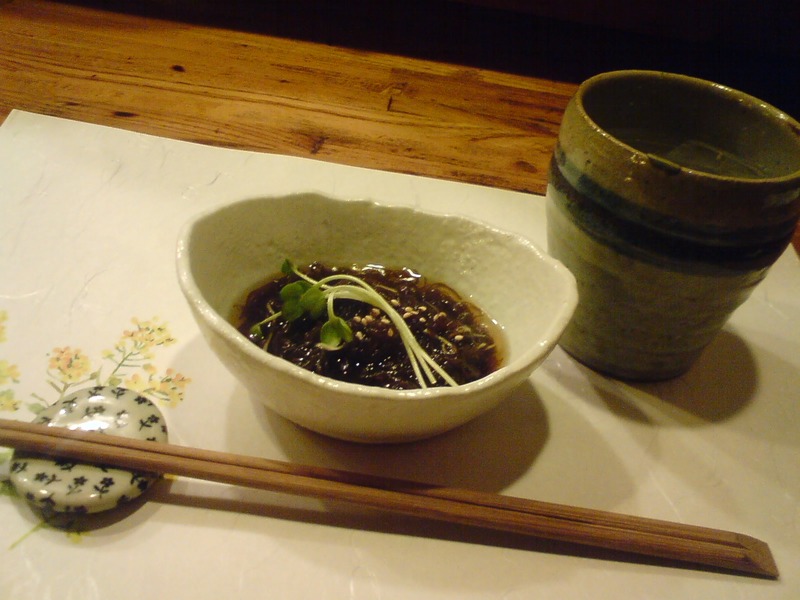 An example of seaweed salad with wakame and agar. 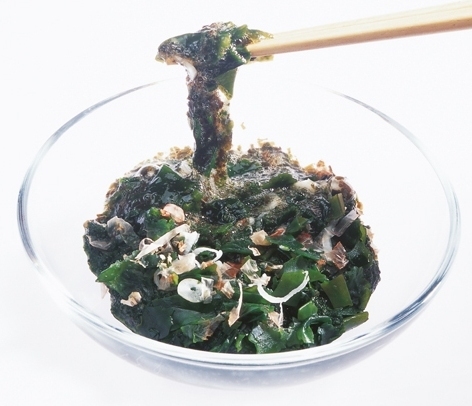 Another seaweed salad with samples harvesyed in Noto Peninsula, Ishikawa Prefecture! 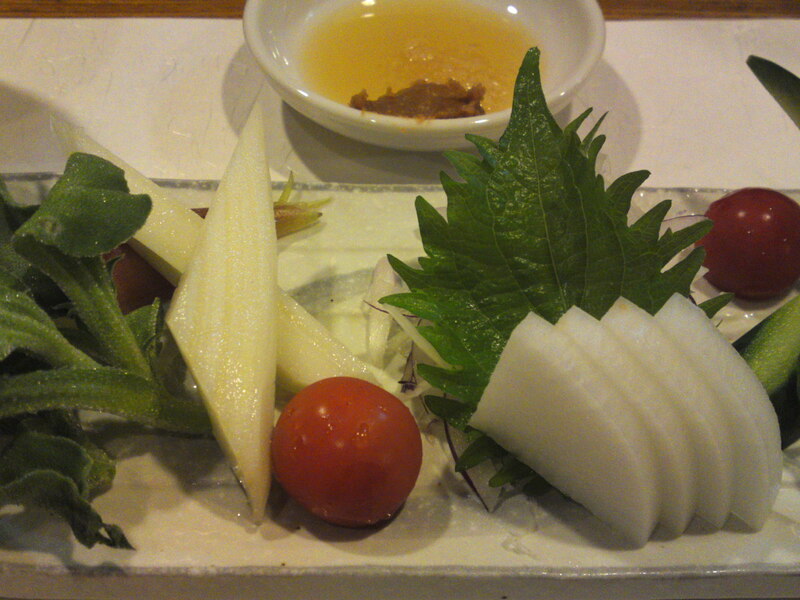 An Okinawa variety called somen nori! Another local variety called Tsunotama/Horns and Balls! 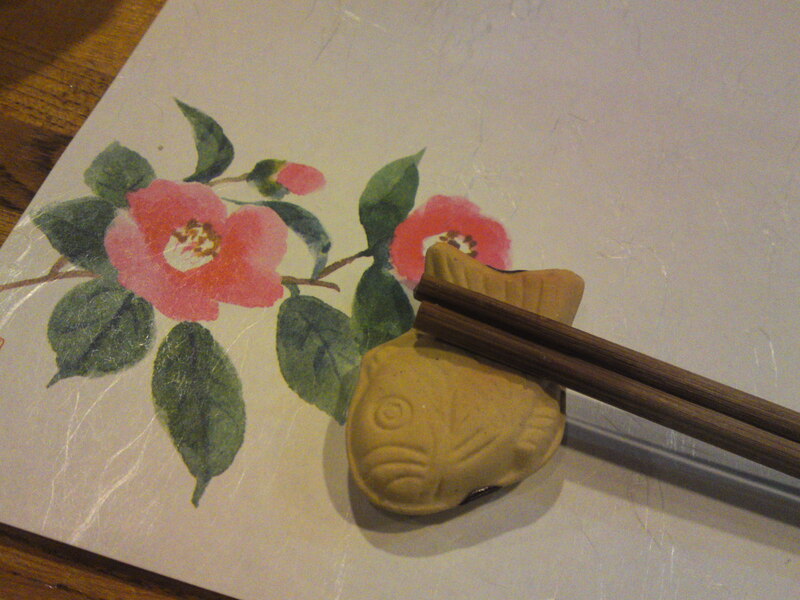 Wakame sticks cooked with miso paste! 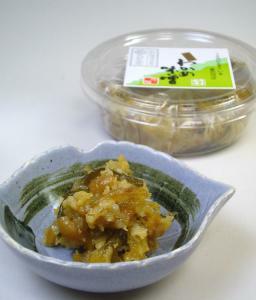 Wakame and Miso Paste mix from Kanzanji, Shizuoka Prefecture! 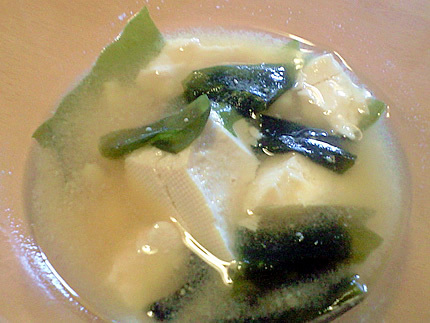 Wakame, tofu and miso Soup! 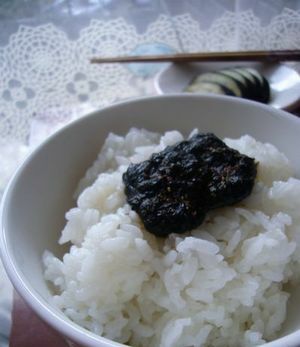 A bowl of freshly steamed rice with seaweed paste! 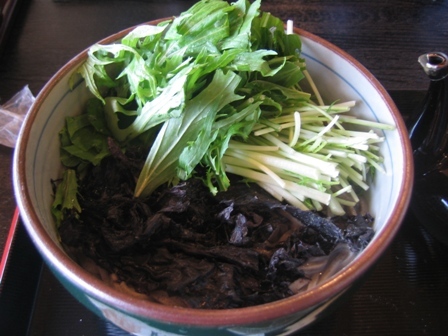 Soba/Buckwheat noodles with nori and green leaf vegetables! 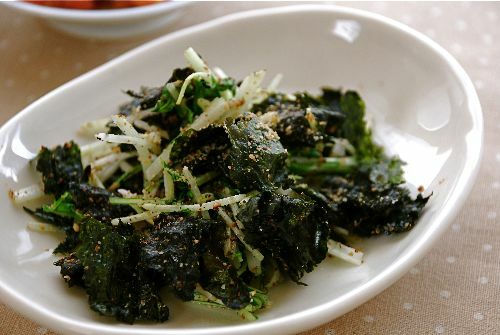 Seaweed, trefoil and ground seame seeds salad! 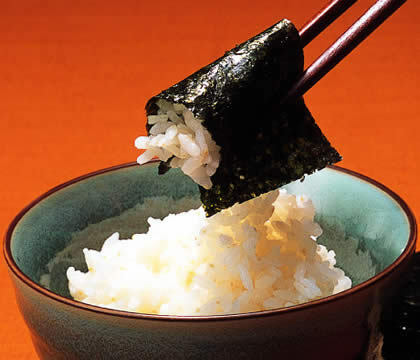 The best way to eat rice? 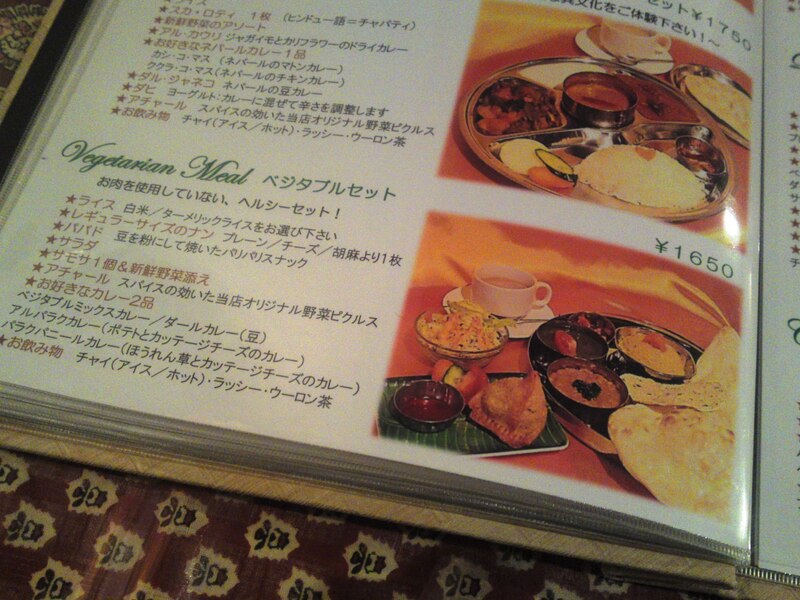 Strong points: Vegetarian and ethnic cuisine. Easy-going atmosphere for all ages and trends. Home-made umeshu and biscuits. 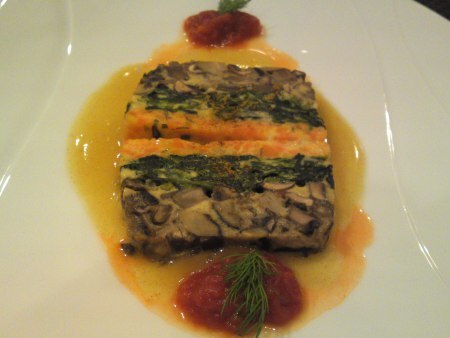 Can prepare a vegan meal with sufficient advance reservation. 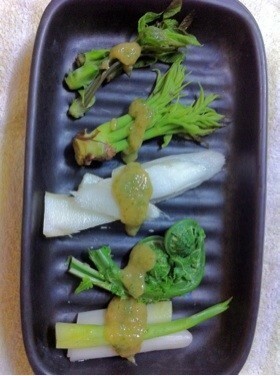 Wild Mountain Vegetables (Sansai/山菜): Five Mountain Vegetables in Japanese Pepper Miso Sauce (山菜五種盛り山椒味噌和え)-Vegan! 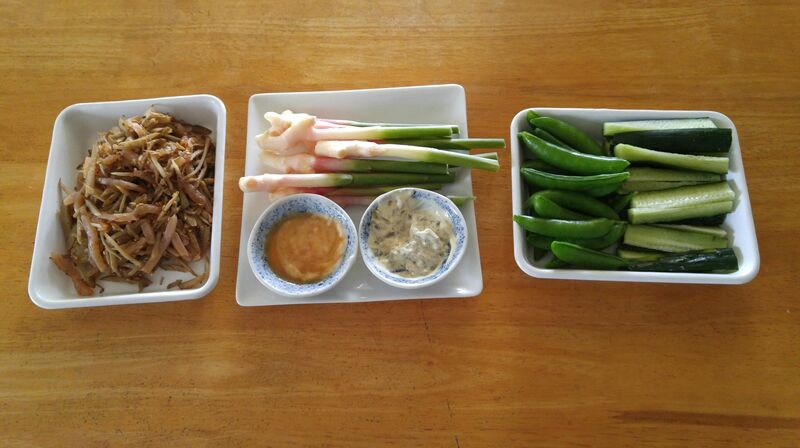 I was asked by new Czech Friend IVY if I could suggestsome Japanese recipes to accommodate wild mountain vegetables especially Urui/Hasta Monta and others. 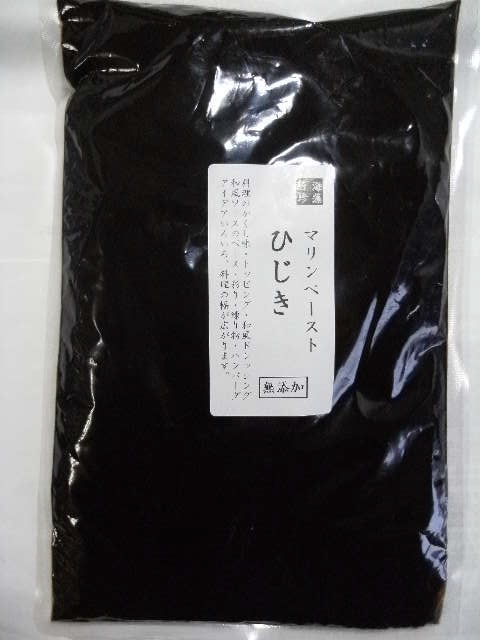 The Japanese pepper/Japanes pricly ash is called sanshyou/山椒. In Japan we use both young leaves and green seeds, whereas in China they use the dried seeds. Peel the udo. Cut into thin slices lengthwise. Rinse under cold running water. Cut the root part away from the kogomi. 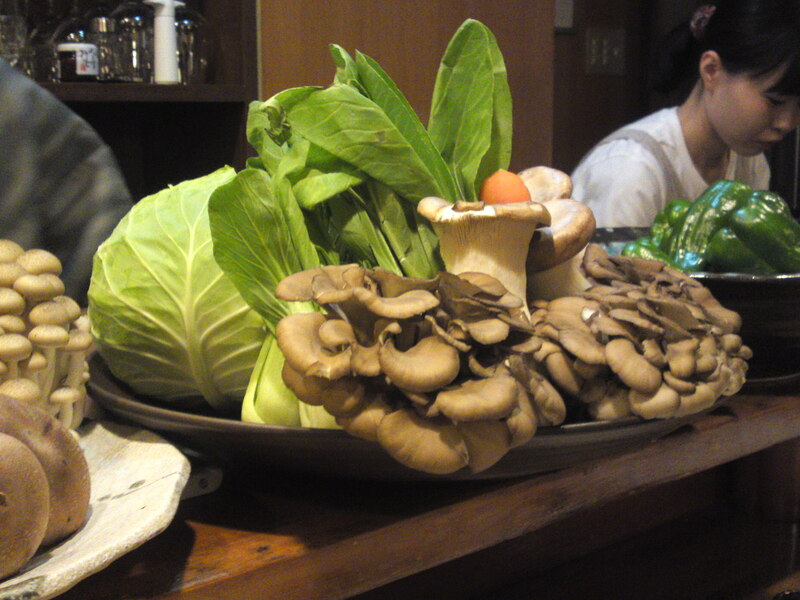 Boil the kogomi and urui lghtly. Drain and sponge off excess water. Cut the urui in same bits of the same size as the kogomi. 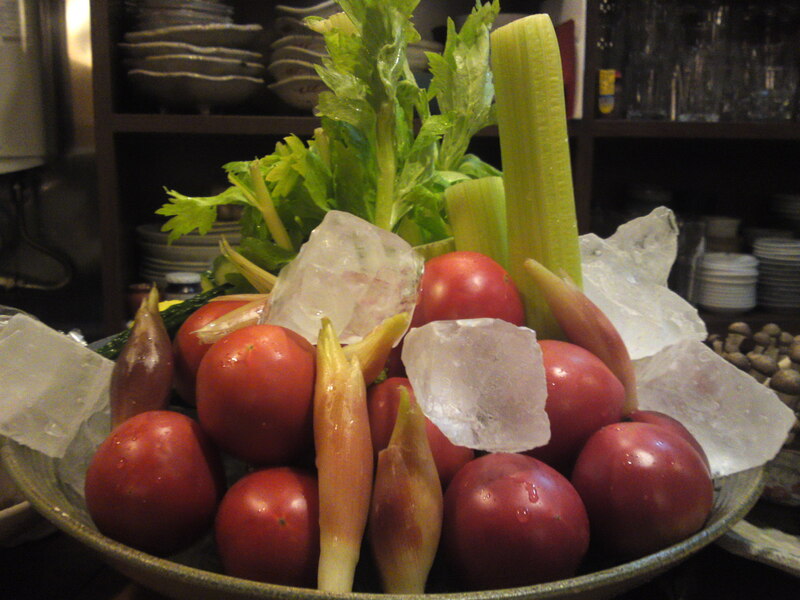 Actually do try to prepare all the vegetables in same size if possible! 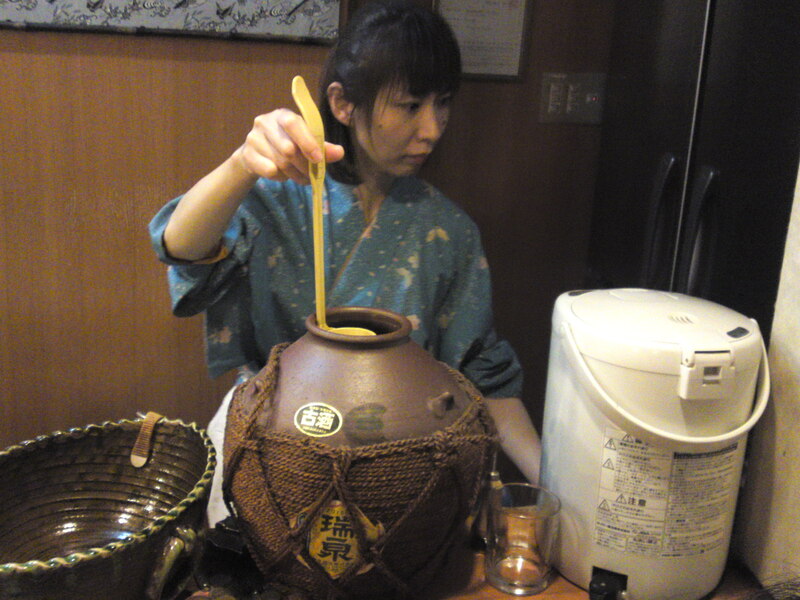 Boil the tara no me and the koshiabura lightly. Drain and sponge off carefully excess water in a dish lined with kitchen paper. Chop or crucnh the sanshyou leaves finally and in a bowl mix them with the miso, sake and sugar. 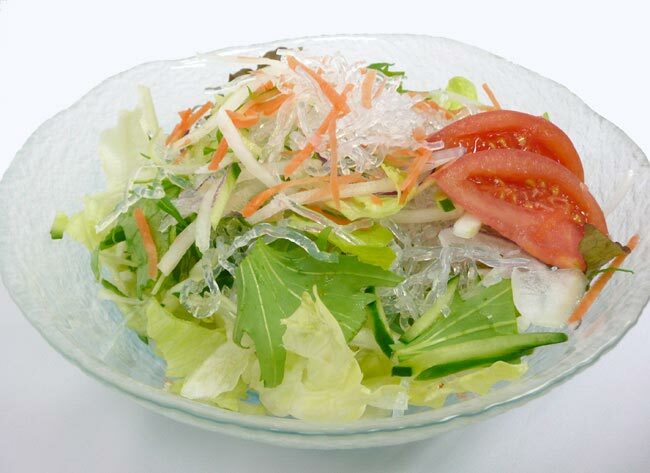 Arrange the sansai in a dish as above and add the dressing. Mix all vegetables and dressing together and serve as artfully as possible! An easy, tasty and healthy recipe!